When a recipe calls for frozen artichoke bases, a bit of research reveals that these can be procured at specialty stores such as this grocer in St John's Wood, so we made our way there on foot on the weekend. The walk and resulting dish were both excellent. I've been getting lunch from my favourite Arabic/Levantine street food place Zaroob every day this week, and while I was waiting for my order of fattoush and zaatar manoushe today, I asked this cook if I could film him making the Egyptian fateer. 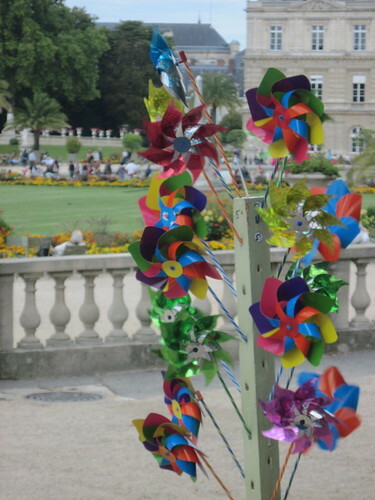 He said he's been making this for seven years now, and he gave it an extra bit of flourish for the camera. Making Fateer at Zaroob from eastcoastwestcoast on Vimeo. My neighbour at work brings ginger cookies from the one grocery store that stocks foods from his native Sri Lanka, and these are excellent snacks: very spicy, very good with a cup of tea. They are sturdy enough to be dipped into the tea and maintain their integrity, but after a few, my mouth starts to burn. But it's not a chili burn, just very strong strong ginger. So this morning, apparently he spotted me getting into a crowded elevator while he was also in the lobby, and he caught another elevator that didn't stop on as many floors. This gave him just enough time to get another box of ginger cookies out of the bag and stand, video rolling, waiting for my elevator car to arrive. Of course, I had no idea he had seen me, so I was hugely surprised to see him waiting there with the cookies, and you can see my reaction here. Oh my God, I laughed and laughed after this. And then enjoyed the cookies with my afternoon tea! Ginger Biscuits from Sri Lanka from eastcoastwestcoast on Vimeo. 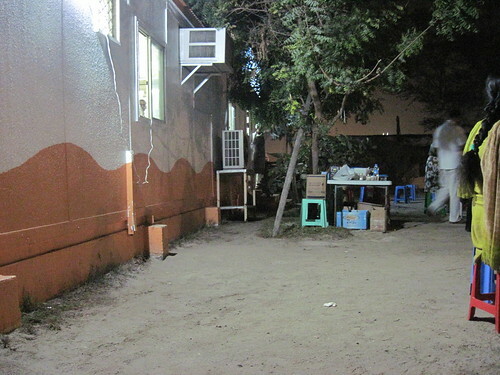 This is an Iranian bakery and restaurant, and dinner here is served at comfy outside tables, under the stars as the calls to prayer sound from nearby mosques and local residents start their evening pick-up games on the nearby volleyball and basketball courts. We order the kebabs (lamb, chicken, many other delicious varieties), which arrive on heated grills with roasted tomatoes, a handful of fries and some rice as a foundation. One of my favourite parts of the meal is the basket of stone bread, called sangak, that arrives while you peruse the menu. Bubbly charred bread, warm, coated in sesame seeds, it's fantastic. 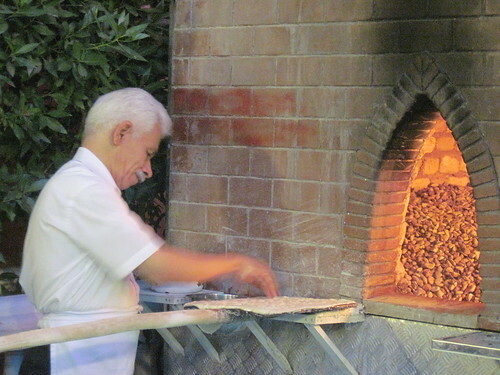 After you've finished your dinner and sipped the sweet black mint tea, you can wander over to the bakery entrance where this mustachioed man is busy at work making the sangak, patting the dough onto the pallet and then plopping it onto the pile of superheated stones inside the oven. I like watching this guy work, he's a bread craftsman. And then have a nice stroll along the nearby Satwa Road for some excellent people-watching and vibrant street atmosphere. For me, this is the best kind of Dubai evening. It's the day after Christmas and after returning from a morning workout, we are seated in the window next to our tree, with stacks of books from Santa piled around us and big cups of tea & coffee. The kitchen is sparkly clean and the only evidence of yesterday's great meal is the fridge, which is the fullest it's ever been, with every shelf and every piece of empty space filled with food & containers. I've enjoyed cooking lots of good dishes this year, and our Christmas meal was particularly memorable because there were so many "firsts" and because we cooked it together. Let me first capture, in this Cooking Year in Review, the Christmas feast! It was such a bounty, all so tasty, that we didn't even have our Stilton & port, cheeses and mince pies (we'll have those over the next few days, no worries). Chocolate swirl buns - We went for a walk early early in the morning, while the air was still chilly (for Dubai) and the only other folks out & about were the cleaners and labourers. 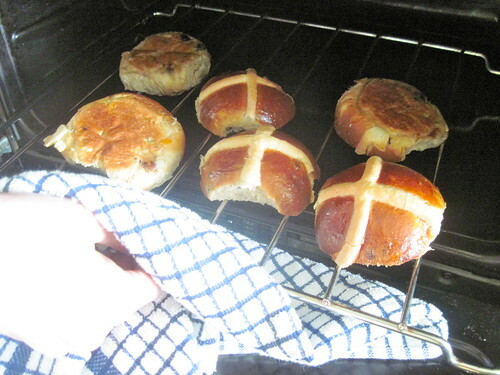 When we got back to our building, we stopped at Starbucks and then brought our coffees upstairs to sip while the tin of these buns that I'd made the day before went in the oven. They were good! Dense, richly chocolate-y, almost too much to have more then one (or two). A very nice Christmas brekkie. Turkey - We pre-ordered a "small" bird from the Waitrose and my arm is still sore from carrying the 4kg bag home on the 24th. To prepare, we followed a combo of tips from Chuckie, who prescribed making a paste of lemon rind, oregano, sage, thyme, salt & pepper to rub under the skin along with some butter, and this Canadian Living basic article. We pulled out the bag of giblets but then couldn't figure out the neck part, so we looked up a YouTube video to see what that was all about, and then one of us held the ball of the bird while the other grabbed inside the cavity. It was like a breach birth, and we both pulled in opposite directions before it finally came out. "It's like an alien," I said. After all that prep, it came out of the oven after three hours of roasting and it was just perfect. The herb & lemon rub had soaked through the breast meat and it carved up perfectly. Deeeeeelish. Also, the soup that I made with the leftover meat (just added shallot, carrots, celery, thyme, bay leaf and broth) was the BEST soup I've ever made. Stuffing - a combo of this recipe and one from my Mom, the fresh sage & thyme were key to making it super flavourful and savoury. I made this on Christmas Eve so all we had to do was throw it in the oven to reheat after the turkey had come out and was in that resting stage. We have lots of leftovers, and leftover stuffing is always yum. Roast potatoes - made these and they had lots of good crunch. The rosemary gave it a nice flavour and we also used a sprinkle of the Maldon Smoked Sea Salt that Santa brought me. I followed the advice to simmer them for 15 minutes, but this made the potatoes a little too soft. They were still great, but next time, I'll keep a closer eye on that phase of the prep. I also peeled & chopped the potatoes the day before to save us time on Christmas. Brussels sprouts & broccoli - nicely done, clean boiled. Yorkshire puddings - as I watched the oven, mesmerized as the little things poofed out from the muffin tin, I joked to James that I was going to make these for every single dinner from now on. Super easy and quite a decadent treat. Gravy - also a triumph in that it was lump-free and delicious. We used a mix of chicken broth and pan drippings, the latter bringing in some nice flavours of the lemon herb rub. A nice pour across the plate brought the whole meal together. Cioppino - cooked this flavoursome tomato-based stew for our New Year's Eve feast in 2012, incorporating tiger prawns and hammour that I had purchased at the Deira Fish Market that very morning. I couldn't find a can of clam juice anywhere in town, so substituted chicken broth (just fine). Good with some baguette and butter and a nice glass of red wine. I made this again in November on an evening when I felt like cooking something with lots of chopping and simmering, and something that is healthy as well. So good, so good. And a nice excuse to have a glass of red wine, since the recipe calls for a cup. The leftover sauce was really good as a nice chunky pasta sauce the next night, especially with the leftover basil on top. Lentil soup with sausage - Oh Dubai. The market that I went to had a pork section, but did NOT have nice sausages (only hot dogs) so I substituted pancetta, and then couldn't find kale and didn't feel like forking over nine bucks for spinach. Beyond that, it all worked out nicely. The pancetta gave it a nice smoky flavour and the rest of it was loaded full of veggies, which made it feel quite healthy. Baked potato slices with cheddar - First recipe that I cooked from the Smitten Kitchen Cookbook and it was a major winner in our house. Like thick coins of potato, roasted until crispy and then topped with a bit of cheddar, a dollop of sour cream and a sprinkle of spring onions. Devoured. Gnocchi with tomato broth - Another from the Smitten cookbook, and in this one, I made a really major substitution. We had some instant mashed potatoes, so I prepared those and then blended them into a dough with flour and egg, rolled them out into a tube and cut into little gnocchi pieces. They were absolutely delicious! I froze them overnight and we had them the next night for dinner with the tomato broth, yum yum. Cheddar swirl buns - Smitten Kitchen cookbook. I made the dough on a weekend morning and set it out to rise while we went for brunch and then puttered throughout the day. I then pressed it into a rectangle and spread a layer of shredded sharp cheddar, finely chopped shallot and dill onto it, rolled it into a log and sliced it into twist wedges, which were baked into lovely savoury twists. Crunchy and cheddary, with the shallot adding the perfect amount of flavour. Dinner with a side of cucumber salad that incorporated the leftover dill, yum yum yum. Baked rice with eggplant and mozzarella - The recipe is actually called "baked orzo" but the Spinney's doesn't sell orzo. They sell arborio rice though, so I took the risk that this would substitute nicely for the pasta and it worked very well. 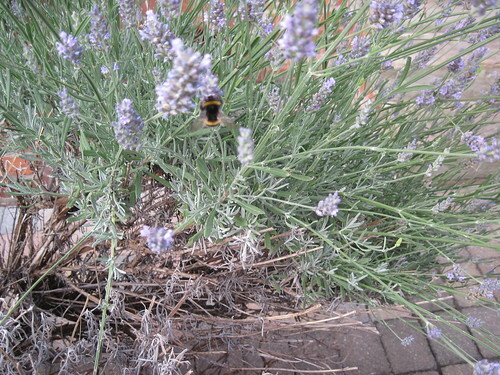 I also substituted thyme for oregano and did the rest as is, yum, very savoury and an excellent dish to scoop out for lunch and many subsequent dinners. The lemon zest is a key ingredient, lending a nice "sunny-ness" to the flavour, without overpowering. I also doubled the celery and carrots, because I love those flavours. Peppers stuffed with quinoa, veggies and feta - These are full of veggies and yet quite savoury because of the feta and quinoa, which I substituted into the recipe for couscous when I saw that our little Spinney's was actually carrying it! And not for $20! Hachi Parmentier (French shepherd's pie) - On a quiet weekend, James said we should cook something together, so I read through the recipe titles that were in my "want to cook" list and when I got to the French shepherd's pie, he said that sounded good. This has been on my wish list for years now, and it was a fantastic result. We made a few modifications, like we couldn't get sausage for the filling at our pork-free grocery store, nor did we have fancy Emmental or Comte cheese available to us (good cheddar substituted in) and I opted out of the heavy cream in the mashed potatoes step. Yet the final result was amazing. 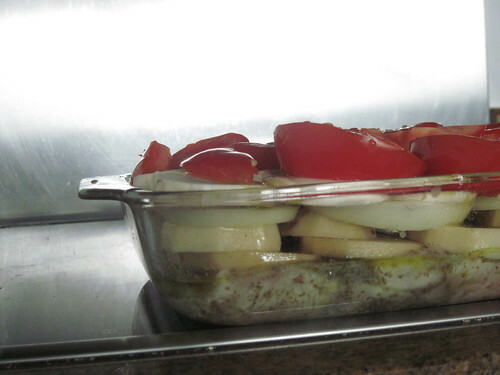 It was a perfect dish to cook on a weekend, because it took about 4 hours or so, resulting in a baking dish filled with a nice filling of bitesize pieces of roast & veggies in broth, topped with mashed potatoes and a bit of cheese. Potato salad with green beans and pesto - I made this last year, and dug up the recipe again this year when I had a craving for pesto flavour and the crunchiness of the green beans. Hummus - My Arabic cooking class taught me to peel the chickpeas. Then my blender broke. So it wasn't ethereally smooth, but chunky and textured. I used a mortar & pestle the next week and it was much smoother. Truly delicious. All about the tahini and lots of fresh-squeezed lemon juice. In another case, when I didn't feel like peeling chickpeas for 40 minutes, I substituted cannellini beans from a can and realized that the key to a good hummus, for me, is the tang of tahini and lemon juice. Potato pizza - My office in NYC was right next to the Sullivan Street Bakery and I would often jet down there for a quick slice of thin pizza for lunch. The potato one was always excellent, the potatoes crispy at the edges, the flavour of the onions & olive oil. I made this on a chilly ("chilly" - Dubai) Saturday evening using this pizza dough recipe. Saturday night spag bol - This blogger's description of a nice pot of bolognese sauce bubbling away on a Sunday evening inspired me to cook it for our weekend spaghetti dinner. The key step was letting the broth reduce down so that it had a nice rich flavour. Meatball soup with orzo - The recipe calls for escarole, but I used chard instead. The meatballs are really tasty, and make this a nice, filling meal. Baked feta - A favourite from last year, a repeat this year, ultra easy. Get a block of feta; cover it in olive tapenade, chopped cherry tomatoes, chopped onion or shallots, and some fresh herbs; and bake it for 20-30 minutes in the oven. Scoop it up with tasty pita bread. Vegetable soup with rosemary and chickpeas: Forever a classic way to get lots of veggies in a satisfying meal. Put carrots, celery, an onion, chickpeas, rosemary & other herbs in a big pot with a bunch of water and some diced tomatoes, and let it simmer away, what a flavourful broth! Roasted eggplant with tahini sauce and crispy chickpeas - The second recipe from the Smitten Kitchen Cookbook, the very next night, and this was excellent. I used 0% Fage yogurt for the sauce, and the mix with tahini and lemon juice was the best part of the whole entire recipe. I also used curry instead of cumin, and the chickpeas were very crunchy and tasty. Falafel - First attempt was good, but showed me that I could make some improvements still. Our favourite meal at Borough Market is the falafel stand, and while mine could never match their magic, pairing these little chickpea patties with pickled vegetables and yogurt dip made for a very satisfying meal. Second attempt was even better. 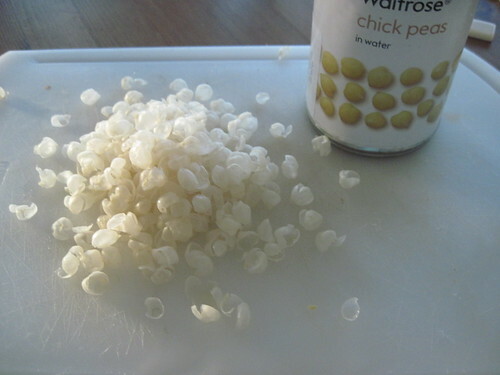 I used a mortar and pestle and added a bit of the chickpea water and a cup of chopped onions to really moisten into a paste. I also added a lot of black pepper for kick. This time they formed nice little pucks and didn't fall apart, and they fried up nicely, and were delicious wrapped in a pita with pickled vegetables (tahini yogurt sauce would have made it even better). Avocado tartine with cucumber and sesame seeds - From Smitten Kitchen cookbook, a nice light dinner that tasted like heaven. The intro to this recipe talked about how it was inspired by sushi, and it really had some great flavour with the toasted sesame seeds and rice wine vinegar mixed with the vegetable ingredients. Fresh fresh baguette also helped. Nice with a glass of cold white wine on a weekend night. Frittata with potato, feta and spring onions - Smitten Kitchen cookbook again. 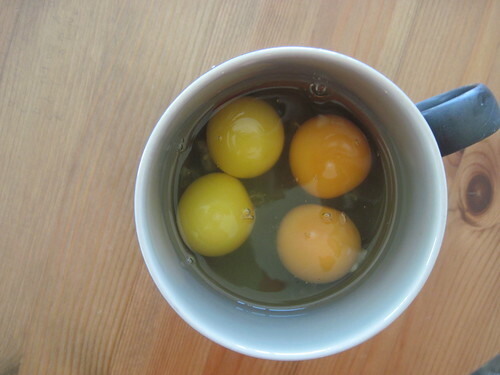 I got another massive supply of farm fresh eggs from a UAE local, and I used about 10 of these little, golden yolked beauties to make this frittata in a pie dish. I didn't use the bacon that is required in the recipe, since I didn't feel like making the special trip to a grocery store with a pork section. It was delicious. The feta's saltiness was marvelous. In another version, I used leek, spring onion and feta and it was delicious. Frittata with potato, kale and parmesan - Smitten Kitchen's recipe called for broccolini, but this stuff was way too expensive at our grocery, so I substituted kale. Her advice to not skimp on the parm crust on top is totally right-on, this was delicious. Great leftovers for lunch the next day too. Leek fritters - Another Smitten Kitchen cookbook, delicious, my "best fritters yet" according to James (previously, broccoli, zucchini, corn). Made these on a rare drizzly Dubai afternoon and then made them again and again and again. Curried lentil soup - A favourite from previous years., I love that this is full of good veggies with the zing of ginger. Made this again the night after the leek fritters because we had some sour cream leftover from those, and I dolloped a scoop on each bowl of this thick soup. Avocado cucumber feta salad - Such a cinch! So tangy and refreshing! Cube three cucumbers, an avocado and a brick of feta, mix with some chopped Italian parsley, pour on a dressing made from the juice of two squeezed limes and olive oil, and enjoy. I didn't add salt because the feta had enough saltiness, and I used parsley instead of the mint prescribed by the linked recipe. Still just as good. Thick sweet potato slices - I didn't make the salsa of goat cheese, pecans and celery, although it looks delicious, but just used the technique to roast thick round coins of sweet potato. Yum. Gazpacho - With no blender in our household, I followed this ingredient list, but made the soup in the style of the one I had enjoyed at Brasserie Balzar in the previous week while in Paris. Finely chopped tomatoes, green peppers and cucumbers, sprinkled with small pan-fried croutons and then a thick sauce of tomatoes poured over top it all. The sauce was made from crushed tomatoes, a glug of olive oil, another glug of port and a sprinkle of salt and pepper, all simmered and then chilled in the fridge. If I were to make it again, I would drain the sauce through cheese cloth or a sieve, in the style of the recipe for gnocchi and tomato broth in the list above. Thinner and chilled, refreshing. Okonomiyaki (Japanese vegetable pancakes) - Back from Hong Kong, in the mood for something healthy and something with the flavours we'd sampled on our trip, I was inspired by this recipe from Smitten Kitchen for Japanese vegetable pancakes and whipped up a mix of shredded white cabbage, shredded carrot, shredded ginger and chopped parsley. The fritters were fried until crisped and served with oyster sauce for dipping, really really really good. The ginger is a key ingredient. Sesame-spiced meatballs - Another one from the Smitten Kitchen cookbook. I used ground beef and added some parsley, and skipped the stuff like cayenne. The cumin and toasted sesame seeds gave these an excellent flavour, and the pre-browning step meant that had a nice crunchy outer layer. Served with a tomato salad and dip made of 0% Green yogurt, tahini, lemon juice and pepper. Excellent. White bean stew - A perennial favourite and a great way to get a flavoursome bowl chockful of veggies. The white wine gives it a nice extra note of richness too. I use spinach, just because kale and chard seem to be impossible to find around here. Sundried tomato stuffed mushroom caps - We started one weekend with what I called "hors d'oeuvres for dinner", and I stuffed white mushroom caps with a mix of chopped mushroom stems, onion, bread crumbs, sundried tomatoes, thyme, pepper and an egg yolk, and then topped with some shredded parmesan. The key step to this recipe is the first one, where you roast the mushroom caps first to get them to expel the water, that way they're not all soggy when you bite into the finished product. Fantastic with a glass of Malbec while watching Thursday night cricket. Borlotti bean salad with feta, walnuts, onion and parsley - This appears in the Smitten Kitchen cookbook and while she hasn't published the recipe online, this one in the NYTimes comes close: mix two cans of borlotti beans with diced celery, feta, onion and chopped parsley and dress with a mix of vinegar, pepper and olive oil. The best part of this salad, other than the fact that it's a totally satisfying meal in itself, is that it keeps really well for several days. I had tons of lunches with it, and the onion totally mellowed out after day one. Fantastic. One night for dinner, we had small bowls of this with leek fritters, deliciousness. Barbecue chicken pizza - One day at work, I was struck with a lightning bolt craving for barbecue chicken pizza. How specific and how random. Like, why not just pizza? Why that particular combo? I think it might have been because we hadn't been eating much bread or cheese lately, and because any bread-and-cheese combo would need some protein to make it filling. Who knows exactly why, but on a Thursday night, kicking off the weekend, I came home and whipped up a batch of this awesome pizza dough and after it had risen for 30 minutes, into a puffy light dough, I kneaded it in flour, stretched it onto a cookie sheet coated with olive oil and topped it with fresh mozzarella cheese, pieces of chicken that I had cooked in pepper, red onion slices that I had caramelized with barbecue sauce, tomato slices and chopped chives. Baked for 20 minutes, devoured. It tasted exactly how I wanted it to taste and satisfied that craving. And made excellent leftovers for lunch the next day. Asparagus salad with chorizo - I like asparagus. I love chorizo. When shopping at the Waitrose Pork Shop, I got some of sausage and cooked it up. Spring rolls - So much fun to make, softening up the wrappers in warm water, adding the fillings and folding them up like little burritos. Next time, I'd add more fillings, more shrimp, more cucumber, more shredded carrot. Less of the herbs, which overpowered things. Sweet potato cashew korma - Yum, with the coconut rice and garam masala flavours, with lots of fresh cilantro. I skipped the chilis and garlic, for personal preferences. This was even better on the second night when the sauce had thickened, the sweet potato had softened and the flavours had mellowed. I would use the same recipe with a chickpea and potato combo another time, or even chicken. This felt like my first real Indian food prep. Tacos - I didn't use any garlic, but substituted a huge amount of black pepper and the steak was excellent. Folded into flour tortillas (no corn ones at our grocery), with cilantro and onion, it was just what I'd hoped they'd taste like. Also served some chopped fresh tomatoes and avocado with them. After getting a ride back to Amman from Petra with Mr Omar, with only one stop along the way for his cigarette break, we spent the afternoon relaxing and then ventured out to a famous roadside shwarma stand for some street food. As an article in the NYT put it, this place does one thing and only one thing: lamb sandwiches, served with onion, tomato and yogurt sauce, wrapped in a soft pita. 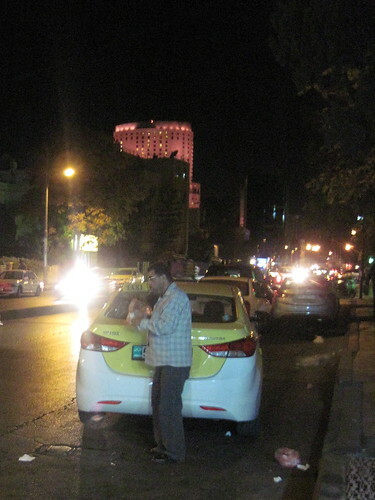 As we waited at the window, along with taxi drivers scarfing down an evening meal, teenagers getting a snack and older folks who had spilled out of a luxury car that double-parked in the thoroughfare. It was delicious, absolutely. From there, we wandered Rainbow Street where we sat at the rooftop deck of a pub for a drink with all of the sparkling city filling the view before us. We see camels all over the UAE, standing in the dunes in the distance as we drive along old Emirates Road, being auctioned at the Al Ain Camel Market, racing at Al Marmoum track, or just looking totally adorable on a roadtrip. 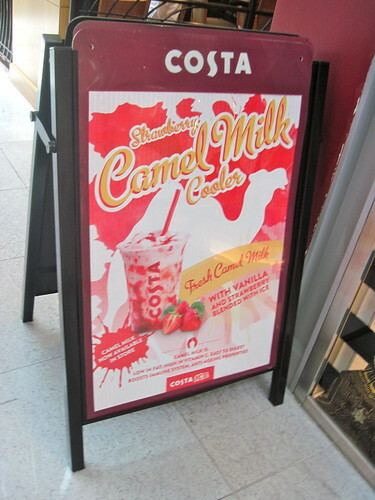 In the last year or so, little niche cafes have popped up, selling camel milk chocolate or ice cream, and the most recent Time Out Magazine announced that Costa cafes in the city were now offering camel milk as an option in their coffee drinks. 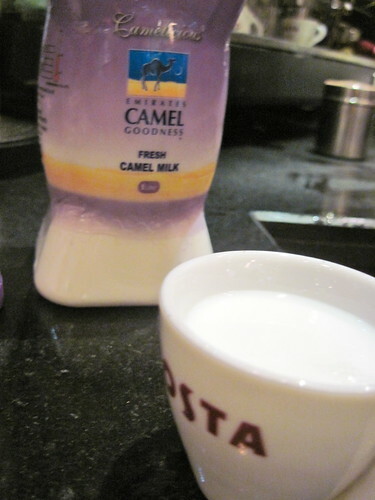 At Dubai Mall, I asked if I could have a camel milk latte and also asked the barista if I could try a small shot glass of the milk itself, having never tried it before. It was good, more like cow than goat milk, but still with a slight unique flavour that Mario Batali refers to as "the taste of the farm". Thank you camels! A plate each of fattoush, hummus that might have actually been a baba ganouj and some stuffed lamb kibbeh, washed down with ice-cold mint lemonade. I snagged these sugar packets that came with our tea because I thought they were so pretty. 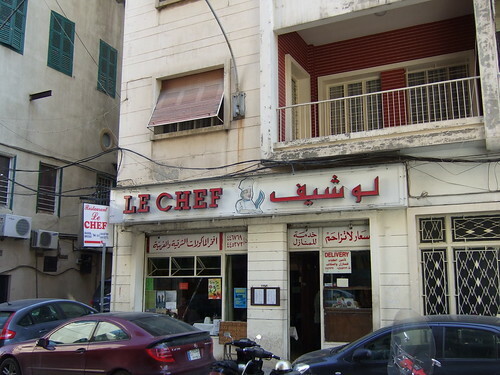 When I took cooking classes here, the teacher told us that proper hummus requires peeling the chickpeas. It's labour-intensive, so she told us how big groups of ladies would gather to gossip and peel away. After seeing a recipe on my favourite cooking class for hummus that also recommended this step, I decided to give it a shot. It takes a while, but it's quite meditative. I listen to podcasts or watch movies on my laptop for the half hour or so that it takes. And I like how the peels look like little tree blossoms. Curried lentil soup: Saw this featured on Posie Gets Cozy, excellent mix of celery, carrots, ginger, lentils, parsnip and more, with a cup of dark lentils. 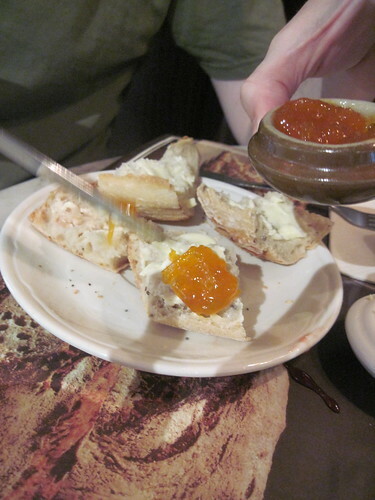 Rich and tasty, excellent with a dollop of sour cream and hunk of crusty bread. Scalloped tomatoes with croutons: This is such a favourite, often inspired by rereading Gabrielle Hamilton's memoir with the author photo where she's holding a crate of tomatoes. About a dozen massive tomatoes, baked with some croutons, basil and cheese. Vegetable soup with rosemary and chickpeas: Put carrots, celery, an onion, chickpeas, rosemary & other herbs in a big pot with a bunch of water and some diced tomatoes, and let it simmer away, what a flavourful broth! White bean stew: There are two versions to this that I have used, and in this one there's a "deglaze the pan with white wine" step that makes the broth even more delicious. Baked feta with tomatoes: This recipe became an instant staple in our kitchen. Like, when you're home late from the office, and trying to figure out what to cook, this is the way to go. Grab a block of feta, a bunch of cherry tomatoes (chop them in half), a jar of olive tapenade, a few shallots or onions and a handful of green herbs. Put it all together and bake for half an hour, serve with bread. Absolutely delicious. Broccoli fritters: I cook this when I just want a big pile of veggies for dinner, they're delicious tempura style and not too oily since they're almost all broccoli. Good with a dollop of dijon mustard too. Potato salad with pesto and green beans: Very refreshing, with crunchy green beans. I used a pack of fingerling potatoes, some of which had purple skin, and their insides were purple too and we had fresh basil from our own garden to mix with the pesto. Asian noodles with cabbage: James and I cooked these great noodles, used regular spaghetti instead of soba since there wasn't any in our little grocery store, and enjoyed this very much. Lots of crunch because of all the cabbage. Cassoulet: We had found jars of this bean stew, imported from France, in the "forbidden" pork section at the grocery store and it is really delicious. But I wanted to make my own! So on a hot July day, I felt like cooking something complicated inside our AC apartment and this recipe had lots of fun steps. I got a lambchop, sausages and bacon (hence the forbidden pork section provenance), and followed the "easy" recipe in this link that uses canned cannelini beans. It took about four and a half hours and the results were fantastic! A labour of love. Roast chicken: Foolproof recipe, works so well! Cooked this a few times, often using parsley and sage from our herb garden. For Christmas dinner, I finally covered the pan with foil and didn't have to scrub out the oven afterwards. Tortilla de patatas: Excellent tapas meal with lots of potatoes and eggs (particularly useful when we were given a massive bag of farmfresh eggs). It's even better the next few days as leftovers when it's more potato tasting than eggy. There's a step where you have to "flip" it, and this is a little scary (made it twice, had a few burns on fingers on the 2nd attempt). Super satisfying. Chicken & Mushroom Marsala: I didn't have Marsala so I used a sweet white wine instead. The mushroom sauce was buttery and delicious. Escarole and orzo soup with meatballs: Fun to make these meatballs and the orzo was really creamy and tasty. I made a ton of substitutions, because our little grocery store didn't have ground turkey or escarole, so I used ground beef and spinach. The meatballs were delicious, and I used our garden parsley. French onion soup: Hurray the Spinneys sells pre-chopped onion. Followed the instructions to really brown the onions and used port instead of the glug of cognac at the end for flavour. It took a few hours of high maintenance work, but the results were delicious. I scooped some into a loaf pan and did the bread/cheese melty thing in the oven. Grilled cheese and avocado sandwiches: No recipe, just put some cheese and avocado slices on some bread slathered in Dijon mustard, heat it up to meltiness. I made a QUICHE! With Egg Fest in full effect thanks to the enormous bag of fresh eggs our neighbour gave us, I hunted down recipes that would use tons of them at a time. This spinach quiche was fantastic and easy easy easy. I burned myself on the oven and will forever think of my proud quiche when I see the scar. Zucchini rice gratin: Smitten Kitchen posted this recipe one week and my Mom wrote to me about it just as I was adding to my need-to-cook list. Instead of thyme, I used zaatar and I added more cheese to the top, because I wanted more melty goodness. Apple cake (sharlotka): More apple-y than doughy, quite sweet and tart. Lime cookies: Because I love lime. Vanilla bean pudding: We bought vanilla for our wine tasting standards and so I wanted to ensure it didn't go to waste. This was a pudding made with whole milk, not too unhealthy, but not as much of the vanilla flavour as I would have liked. Very light. James chocolate stout birthday cake, aka Birthday Bundt Delicious Disaster: In addition to *not* falling out of the bundt pan in one piece, there was also a blizzard of cocoa powder in our kitchen thanks to my hijinks. But WOW did this taste good! Scallion and mushroom frittata: We cooked this on a Saturday night and it was easy and tasty, enjoyed with a nice white wine, baguette and some cheese & salami. It puffed up like a crazy souffle in the oven. Risotto style pasta: I added chicken, and used portobello mushrooms & orzo in this tasty dish, and it was especially delicious the next day after the flavours had all melded a bit more. Chili: Needing a good dose of red meat, I whipped this up one evening. Only had cumin, and didn't use garlic, but it still turned out deeeelicious. Chicken Milanese: I bought Panko bread crumbs and wanted to use it for more than one dish, so I searched out this chicken dish. It was fun to make, dredging in flour, then egg, the Panko+parmesan, and it turned out to be delicious, totally devoured. There's a step where you have to let the breaded chicken sit in the fridge for an hour, thankfully I saw this ahead of time. Bubble and Squeak: "What's 'bubble and squeak,'" I asked James after seeing it on a restaurant menu. Mashed together Brussels sprouts and potatoes, delicious. Simple Tomato Sauce: I made this a few times back in Jersey, and it suddenly popped in my mind in July, so I whipped up another batch of Smitten Kitchen's tomato sauce with onion and butter. Simple and delicious on fresh pasta. Huevos rancheros: You cook the egg on top of a tortilla then flip it over. Mom's quinoa salad with sunflower seeds, cucumber and more. I used dried cherries and couscous because, as I wrote to her, quinoa is tragically expensive here. And I had to shell the sunflower seeds, as I couldn't find a bag of unshelled. Buttermilk chicken: It was juicy and tangy, but needs a day to soak in the buttermilk and then took an hour to cook in our inconsistent oven. If I was to do it again, I'd use chicken breasts instead of drumsticks. Corn pakoras: When I spotted corn cobs at the grocery store, I grabbed them for this recipe. I made a bunch of modifications, like I didn't do the whole seed-toasting-in-ghee step, and added a tsp of cumin to the batter. I also used corn flour instead of corn meal and didn't grind up the kernels. I added an egg to make the patties stick together. But overall - were these every tasty! Rice noodles with peanut lime chicken: Made this one night when we had cold leftover chicken from fajitas the night before. Thin pieces of cucumber & carrot, some cilantro, some chives, some snap peas, some peanuts plus the chicken, all over a bed of rice noodles. The dressing had, amongst many many other ingredients, peanut butter in it, very tasty and tangy. Lemon thyme mushrooms: Yummy! I used zaatar instead of thyme, excellent. Put them on homemade pizza dough. We took a really fun cooking class on Thursday (thank you Santa! ), where we made roast duck with a parsnip puree and a side of roast chestnuts and Brussels sprouts. And sticky toffee pudding for dessert. Our teacher was a French chef who taught us a bunch of little prep tips and tricks, and I think that I can sum up the main reason for the deliciousness this way: lots and lots of butter and cream. After the class, with the weekend kicking off and holiday mode for me, we headed out to Festival City where we sat out on the patio at sunset. What a view! Our neighbour called earlier this week, and asked if I liked to cook, because she had a local farmer friend who had just given her some fresh eggs, would I like some? 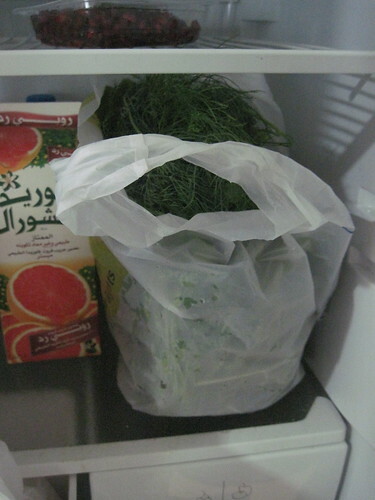 I went straight to her apartment, where she gave us massive bags full of herbs and eggs. And it's been Eggfest ever since. 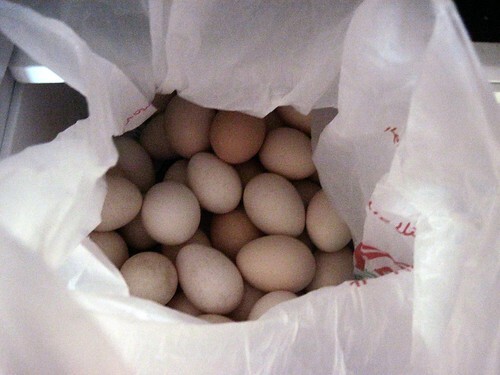 What do you make when you have a billion eggs? Dishes that use lots and lots of them at a time. James's specialty: scrambled eggs with salsa and avocados. A Spanish tortilla de patatas dish that makes excellent leftovers, a nice savoury wedge in the lunch the next day. A Mexican breakfast dish called Migas where you add crunchy tortilla chips and some sausage to scrambled eggs. And, piece de resistance, the first time I've ever made one of these: an excellent spinach quiche, again excellent leftovers. There was a time in my old job, when the flavours & fragrance company brought a training kid to the labs and dipped little wicking papers into each, passing them around so that we could guess what they smelled like. Some were so obvious, lime, vanilla, cinnamon. But others were perplexing, so incredibly familiar yet the name beyond reach until they were revealed later. I can't remember what some of these latter ones were, maybe grape, maybe cherry, maybe clove. When doing a wine tasting, we like to follow the steps ourselves, giving a good sniff and sip to try to guess what we can taste. Sometimes we joke, "I taste a note of... red wine," but other times we come a bit closer, "fruity? citrusy? spice?" 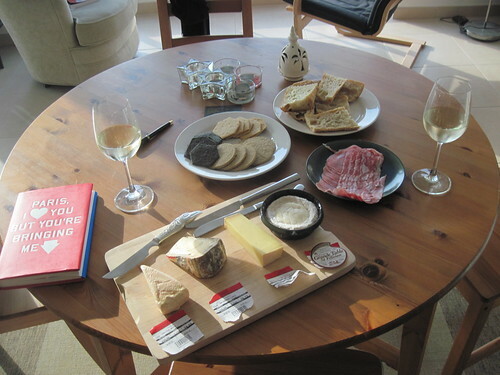 All of the books that I read do the same thing when it comes to teaching you how to do the tasting: swirl, sniff, sip, see what you taste and smell. Which has left me asking, but how do I know what I taste and smell? Where do they get the "gooseberries, grass, lemon and vanilla" descriptions from? Finally, we found a little handout that described how to make fragrance standards so that you can train your nose, and so this past weekend, we embarked on this fun project. First step, save a bunch of jars over many many months. Clean these thoroughly, multiple times, so that all of the remnants of pesto, mustard, jams and more are quenched. Then pour about an ounce of a very neutral wine into each. We used a Yellowtail pinot grigio, cheap and ultralight. James pours into the measuring cup below. Then we assembled all of the flavours. Lots of little mini jams to get the fruit flavours: apricot, black cherry, honey. Other flavours: honey (here), grapefruit juice for citrus, a single clove, vanilla, a little piece of green pepper, gooseberry jam, brine from canned asparagus, and pineapple juice. Label them up (thanks Michelle for these awesome little posties). Seal them up and then do a bunch of blind sniffing, where one of us held an open jar under the other's nose to try to guess. We're now refrigerating these, and next time we have a glass of wine, we'll try to sniff the profile from the glass, and then they say that you can follow with a sniff of a standard to see if it's the same as what you're sensing. Also next, we'll make red wine jars. Neat! Also, PS, this was a *perfect* weekend indoor project when it's so thick and hot outside. 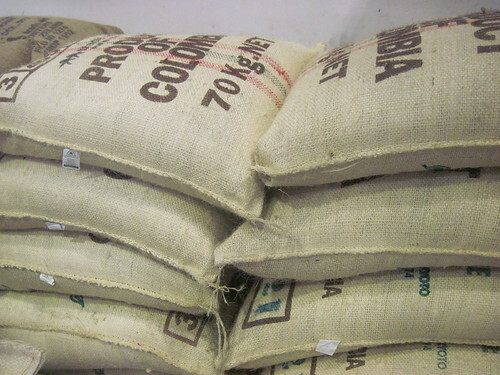 We went back to the coffee warehouse to restock our supply, and they had pallets of coffee on the shop floor, burlap sacks from all over the world. 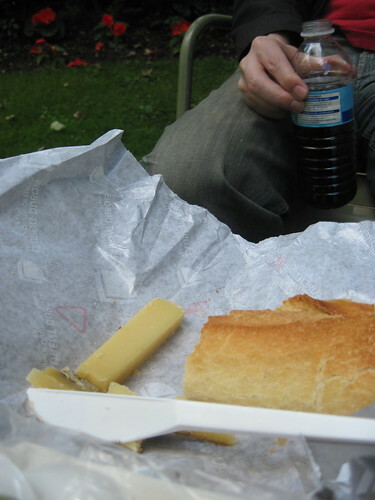 two stinky cheese, 1. the Tomme with an herb rind, chosen for its similarity to the Comte enjoyed the day before in the Jardins de Luxembourg and 2. the St Felicien, oozing like fondue by the time we open it, wrestling with our Swiss army knife to scoop the melted cheese out of the box, our train neighbour wordlessly handing us his proper knife for serving. The Flemish countryside racing past, we finish our lunch after Antwerp. This past weekend, I met James at the airport, arriving early early from a quick trip to Paris. It was Bastille Day, and to extend the Parisian daydreams, we went to the Galeries Lafayette that afternoon to procure some cheese. 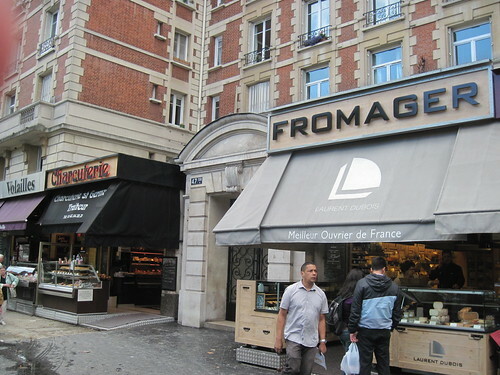 I was reminded of the journal passage above because we bought the St Felicien cheese, though this time we had the beautiful cheese knife from Sonya & Mike and didn't have to wrestle with a Swiss Army Knife. We've started a nice tradition of going out for a good dinner the evening after running a halfer. And by good, I don't mean "swanky," but rather mean "awesomely delicious favourite place." 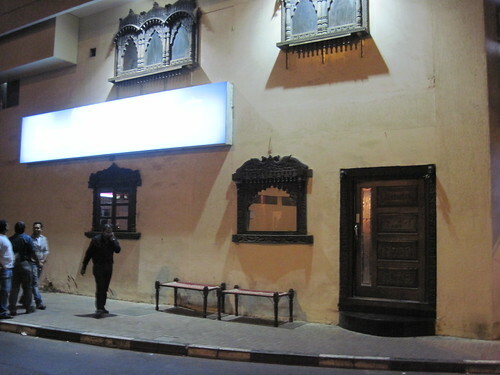 Friday evening's candidate for awesomely delicious favourite place was Ravi, a Pakistani restaurant on Satwa that I've written about a few times before, and we hopped in a taxi in anticipation of a meal of rice, naan and butter chicken. On one of our early visits to Ravi, James ordered that chicken dish and it was so amazing that it has become the go-to entree every time. On this visit, the outdoor tables were all occupied by folks who had just sat down with menus, so we headed indoors for our meal. After dinner, we had a stroll along the boisterous road just as the call to prayer was sounding from the mosque in the neighbourhood centre. 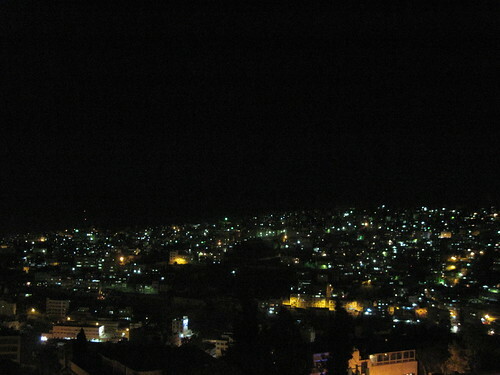 Here's a short video, with the muezzin calling to prayer. 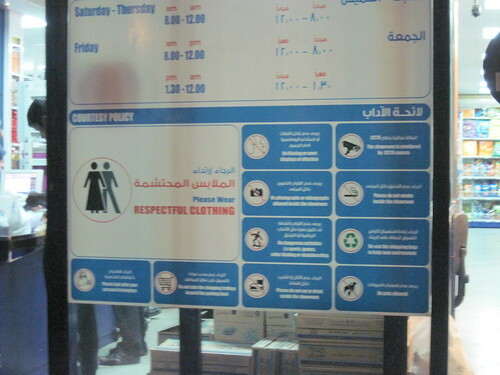 Courtesy policy on a Satwa store, the usual rules of respectful clothing and no smooching. I liked this storefront sign, though when we passed their front door, it was more of a cake and flower shop than a coffee shop. 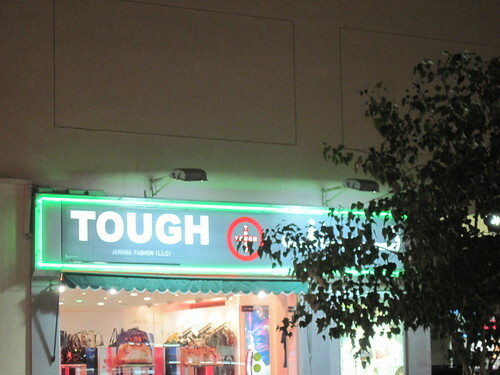 We figure that they moved into the store and just kept the previous owner's fancy neon sign. Planetary magic. 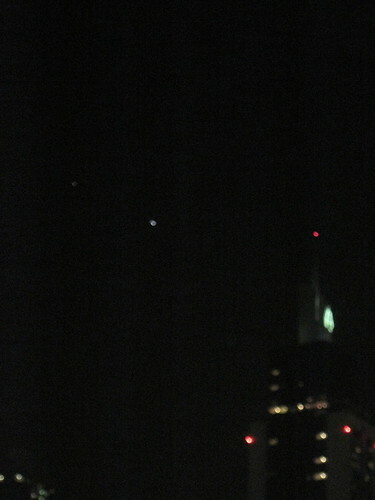 In the photo above, to the left of the skyscraper are two blurs of white light: Venus (lines up with the red light atop the skyscraper) and Jupiter (at "10 o'clock" compared to Venus). They are very bright, the only stars in the early evening sky. Had one of my top-of-the-lifetime-charts samosas: One of the best samosas I've ever had was from a roadside streetfood vendor in Chemin Grenier on Mauritius. Another was enjoyed this weekend, at the Indego by Vineet booth at Taste of Dubai. It was the first little morsel that we bought at the event, and even after many other tasty purchases, it was one of two things for which we returned for a second helping. The samosa was delicious, settled into a bed of spicy chickpeas and drizzled with fresh green cilantro sauce. Had one of my top-of-the-lifetime-charts sticky toffee puddings: I haven't had a lot of this dessert in my lifetime, but the first taste of it was memorable. On an afternoon stroll through Nottingham, I counted my pocket money and had just enough to order a dish of this at a nice cafe in town. I sat at the counter with an excellent book and ate the caramel-flavoured dessert, very slowly, very leisurely. The second taste of it occurred this weekend at the same Taste of Dubai event, and it was the other dish that had us back for seconds: a little slab of spicy cake drenched in warm, caramel sauce. Sandwiches for dinner one night: After the fun of the Taste event, we ate at home the rest of the weekend. One dinner comprised sandwiches of ultra fresh bread, fresh mozzarella and fresh tomatoes, and a dollop of pesto spread. Simple and delicious. Two excellent runs: Friday morning with James, who serves as my speed coach when he joins me on a weekend run, we aimed for a short distance but then stretched it out for a 40 minuter. Saturday morning, I was hoping to go for an hour, but took the turnoff that brought me to the finish at 50 minutes instead. It's getting hot out there. Two good runs, nevertheless. One excellent nap: There are just those moments, lying on the couch with a book, when the waves of tiredness suddenly sweep through my brain and I enjoy a nice afternoon nap. WiFi reading: Two people can now sit and read on two devices on two seats in the window, instead of being attached to the cord in the wall in the corner. 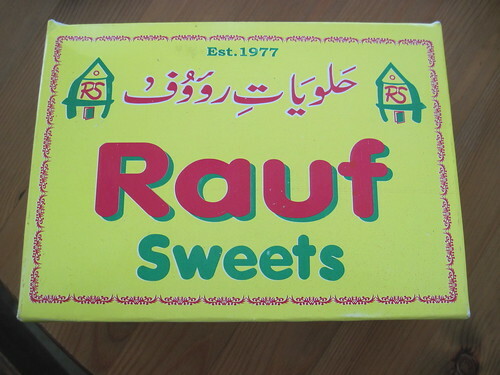 We wanted to get a photo of the candy-coloured goodies at Rauf Sweets in Satwa, and so we bought a box (a tariff for photo-taking, in our opinion: give the guys a copy if they pose, or buy something so that we're not just taking without giving back). 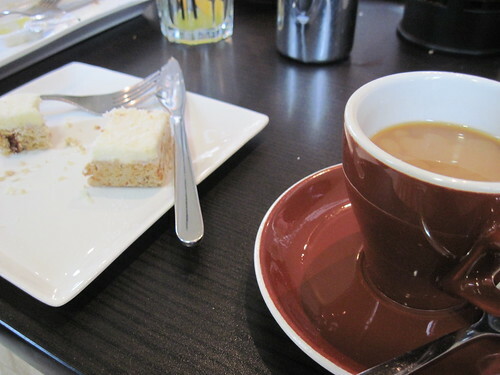 The sweets are thick with dense sugar and condensed cream. Many are soaked in a buttery sweet syrup. Some are spiced with subtle tamarind. I love sweets, but these are very rich and potent for my taste, like eating a thick pat of icing. We tried a few and then stored them in the fridge overnight so that I can give them to the Pakistani drivers at work today. I've mentioned before that the movie selection here in Doobz can be a little flimsy at times, and we've often resorted to checking out terrible dubbed French action movies in an attempt to satisfy a craving for arthouse. And then there are weekends like this last one. Whereas in North America, January and February tend to be devoid of good releases as studios have saved their blockbusters for the previous Christmas season and any potential award-winner has been premiered to slip into the awards season. Jan and Feb in Dubai, meanwhile, are a catch-up time. Finally, NOW, crawling into theatres are some Good Movies. 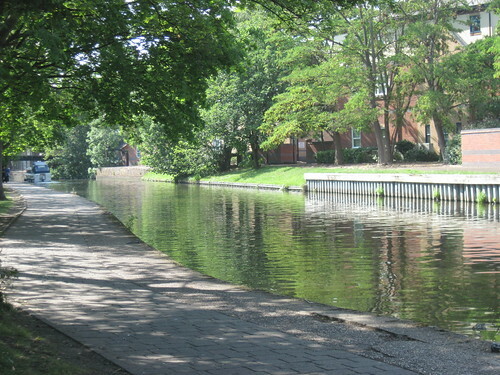 We saw four that appealed to us, and narrowed it down to two for a Saturday outing. The J&J Film Festival! Over to the Dubai Mall, were we first saw Ralph Fiennes' interpretation of Shakespeare's Coriolanus (excellent). 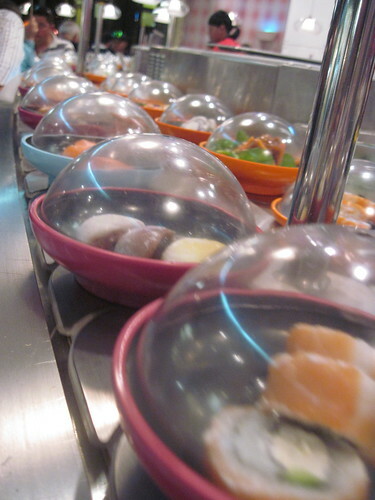 We then had an hour-long break, during which we headed down to the restaurant that has a sushi bar zigzagging throughout the entire seating area. After good sushi, it was back up to the theatre where we sat back to watch The Artist (also excellent). A funny note on this movie, which is a silent film and black & white: the latest issue of TimeOut noted that theatres were having to inform ticket buyers of both of these facts, as people were complaining that they didn't know it would be silent/b&w. We loved it. J&J Film Fest, great success. 2011 Year in Review: Cooking Up A Storm! Zaatar Recipes from Arabic Cooking Class - zaatar has been an amazing discovery since arriving in Dubai, combinging thyme, sumac and sesame seeds into an excellent, flavourful spice. You can use it in a ton of combos, mixed into yogurt like a dip, spread on pitas with olive oil and then broiled for chips... and then these two recipes from my Arabic cooking class. 1. Layer chicken, potatoes, tomatoes, mushrooms and onions and marinate the chicken in lemon juice, zaatar, garlic, and various other goodies. Bake it up! 2. Chicken marinated in tomato paste, lemon juice, zaatar, garlic, etc. Like chicken tikka masala, yum. Chocolate Cake - This recipe reminded me of the chocolate corks at the High Rise Bakery in Cambridge, MA, which are dense and chocolate-y and delicious. This one pan cake was fantastic and filled the house with cocoa fragrance as it baked. Super easy to make, once I found the cocoa at the grocer store. I made it for James' bday and it was very good with some vanilla ice cream (Recipe). There's also a red wine version, that James made me for my birthday, and it was delicious, like a rum ball (Recipe). Baked rigatoni - These little meatballs were so tasty. This dish used almost every pan in our cupboards and took about 2.5 hours to make. But it was as light and tasty as promised. Cellophane noodle salad with roast pork - We couldn't figure out the pork, improvised, missed the required 4 hr marination until we started to cook at 8pm. But deeeelish. Simple vegetable paella from the NYT. A great way to get tons of veggies - chickpeas, beans, red & green peppers, onions, peas, tomatoes, with the filling substance of rice. The saffron makes it fragrant and delicious. Lemon risotto with summer squash. Tasty, the squash I used was orange on the inside, like pumpkin. It was so good with lots of extra greens wilted right in. Didn't use garlic. Delicious when freshly made, but I didn't enjoy the leftovers. Steak salad with blue cheese. 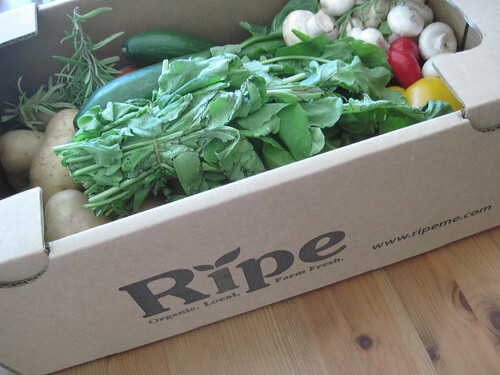 Small fee, big box of veggies! 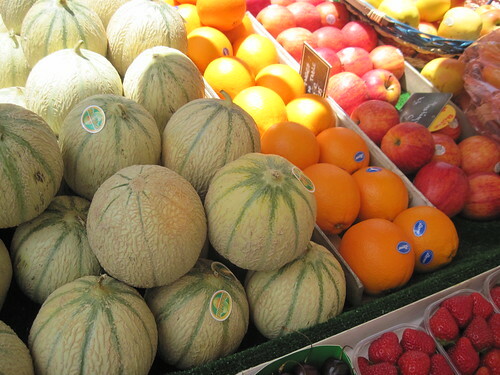 Tasty fruits from the grocery store. After removing the spiky, soft peel of the rambutan, a lychee-like fruit was left-behind. The mangosteen was like a small, ghost-white mandarin orange interior, segments of pulpy fruit. 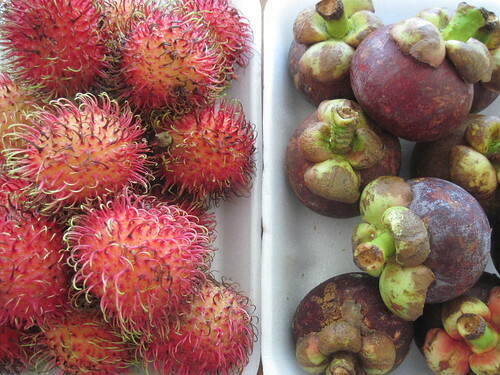 I liked the pink-into-green colour of the rambutan, and the cartoonish "leaves" on the mangosteen. Our first Dubai friends are embarking on new adventures and opportunities in London, and we met them for one last dinner before their departure at their favourite place in town: Special Ostadi. You can take only so much newness before the urge for authenticity strikes. Veer off to one of the city's most historical restaurants, the curiously named Special Ostadi Restaurant. 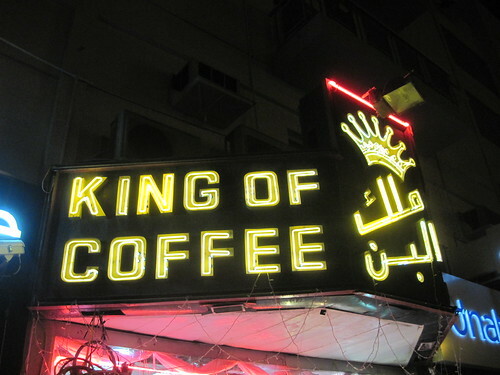 The small spot is 41 years old — ancient by Dubai standards — and is run by a boisterous Iranian man named Muhammad Ali Ansari. 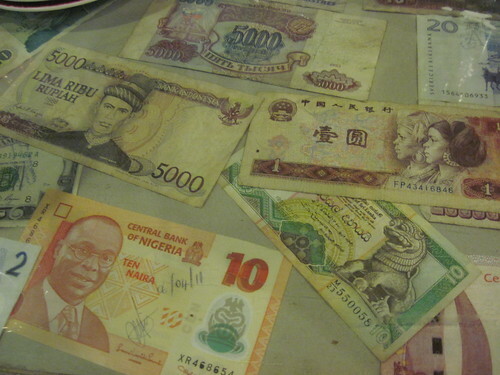 There are only a handful of tables, all covered in a half century of memorabilia, all packed with local businessmen wearing traditional kaffiyehs or shiny Italian suits. The natives come for one thing: grilled lamb kebabs doused in a tangy yogurt sauce and served with pita, onions, cucumbers, arugula, tomatoes and a fat wedge of lime. 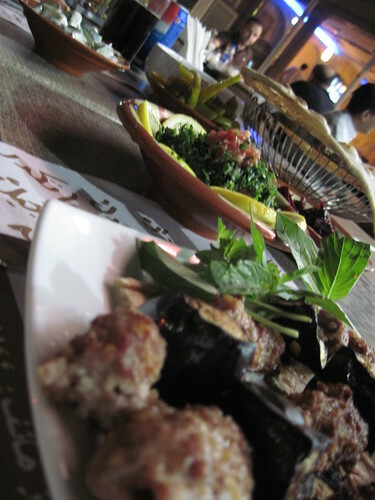 Order a dish of sweet dates and a cup of mint tea to wash it all down. The whole meal comes to 20 dirhams. 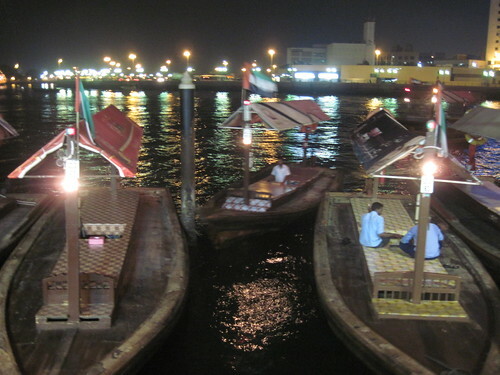 After dinner, we walked along the Dubai Creek, where abra drivers sat on their water taxis, bobbing in the water, and big lit ships cruised along. 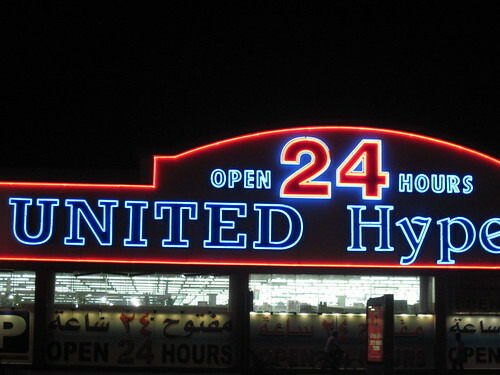 Our friend pointed to the corporate logo lit in neon across the way, and told us that this was his mark on Dubai - years ago, he had money left in the marketing budget and sponsored this sign, which was to be one of the last neon signs in the city before they were outlawed. 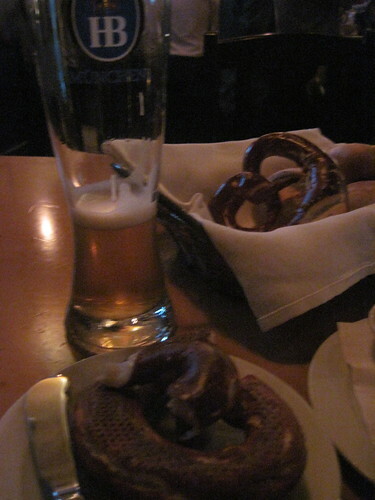 ...a nice pretzel and cold beer always go well a live band wearing leiderhosen. After reading about some of Dubai's best Oktoberfests in the weekly magazines, we decided to try one out on Friday night. Our first attempt brought us to a place that was almost empty, devoid of atmosphere. Where was our tuba band? The second place was more like it: 2-man band playing lots of rousing tunes, with fun party songs like Sweet Caroline and Tequila thrown in for good measure; tall skinny cold glass of beer; and then, bonus, I hadn't seen them on the menu so I thought we were out of luck, but the waiter brought us pretzels! Delivery from one of our favourite Dubai takeout places, Zaatar W Zeit. 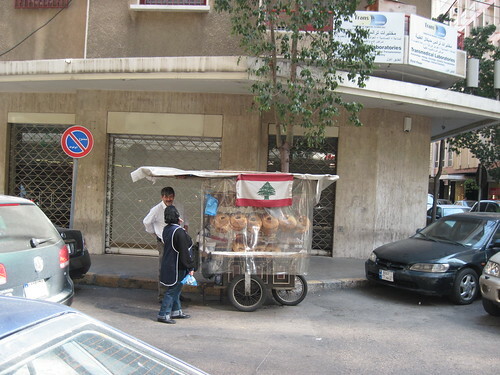 This was the first place that I ever had zaatar on soft Lebanese bread, chewy and stretchy like pizza dough or naan. And that zaatar!! Forever a favourite. 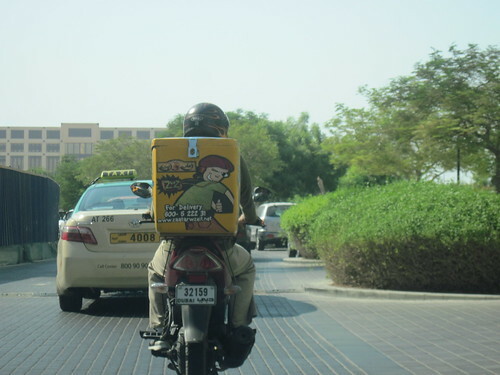 Delivery in Dubai is ubiquitous, as it was in NYC. But here, rather than riding along on bicycles with baskets, they ride motorbikes with insulated (and heated?) packs on the back. Most places use these carry-all thingies as ad space, with distinctive graphics. I like one chicken place's the best, with the clever pun, "Poultry in Motion" as their tagline. 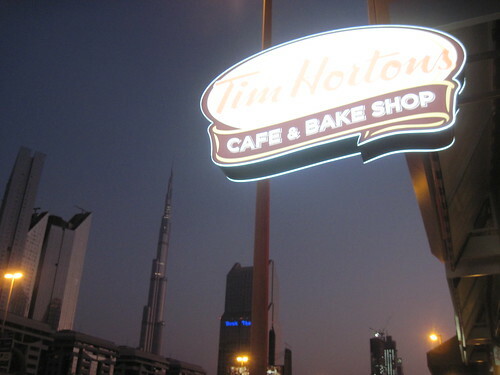 There's a Canadian reporter for The National who has been posting tons of recent updates about the pending opening of a Tim Hortons in Abu Dhabi. Then, out of nowhere, she posts that one just opened in Dubai, and from the description, it sounded like it was very close to my office building. Sure enough, I consulted with the other office Canadian, who is known to import his coffee from Timmy's, and he walked me over to the window of our 24th floor conference room and pointed, "it's right past the metro stop there." So guess where I *had* to go last night! Now, I was never a big fan of the brand while I was growing up in Canada, in fact I'm not even sure it existed on the West Coast, being more of an East Coast staple. But we grew up with the ads on TV ("you've always got time, always got time for Tim Hortons") and had an awesome band teacher with the same name as the donut shop who grinned when we'd sing this in class. So it's not so much about nostalgia for the coffee and donuts, but more about nostalgia for a classic piece of Canadiana. So I left work and walked along Sheikh Zayed Road, looking for the new shop. And there it was, plain as day. You can't see in this photo too clearly, but it's the white oval-shaped sign, across the highway. I took that metro stop overpass to get there. A quick walk in the warm evening air. There looked to be a traffic jam outside, and crowds of people inside and out. Lots of families with kids wearing Roots Canada shirts. A Canadian flag near the napkin stand. Two long lines inside, which gave me lots of time to check out the packed shelves of donuts. 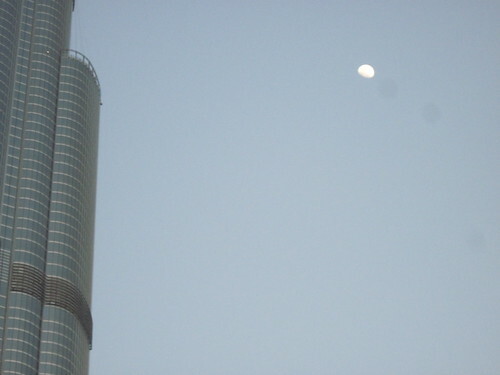 One more shot, with the Burj Khalifa in the distance. And dessert for the evening, a 10-pack. 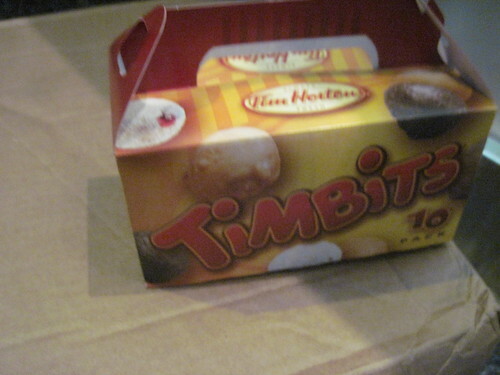 After which I walked back across the highway, caught a cab home, and sent James a text message that said: "TIMBITS!" Scenes below from our picnic in Luxembourg Gardens and on the train, the best picnics of my life. 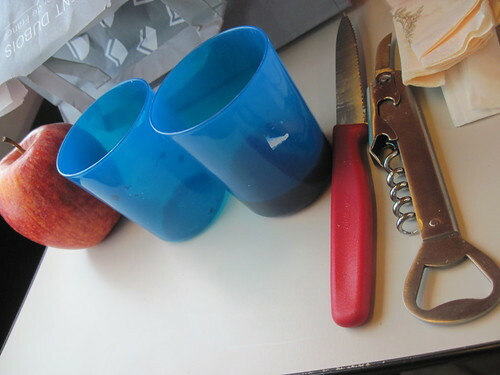 And then our Thalys picnic cutlery, with red-handled knife thanks to the old man next to us, who took sympathy on us as we tried to serve the cheese and gave us a proper utensil. One fruit that we quickly realized was a common descriptor was the gooseberry - and whenever I would see this, I'd wonder aloud, "what does gooseberry even taste like?" And then, this past weekend, I stopped by our neighbourhood organic food place that specializes in local produce, and I perused their jars of jam, looking for some unique Dubai gifts for our upcoming travels. 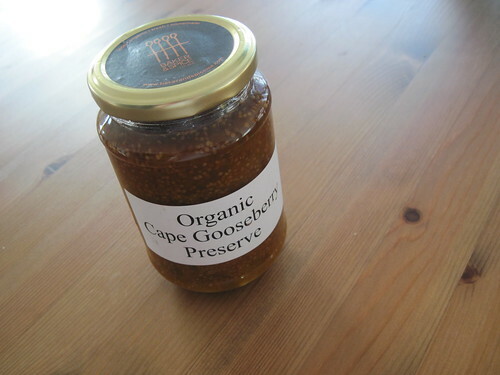 There, on the shelf - gooseberry jam! The next morning, I spread some on toast, and it was lovely. Tangy, tart, sweet. Somewhat tropical, somewhat berry-like. From now on, I'll be well-equipped to detect gooseberry essence. Just had to snap a couple of photos of these weekend meals, because they were so fun to prepare. My Dad always made "Treat Plates" on the weekend, and this was the unintentional theme of our weekend at-home dining. Friday evening, I stocked up on an avocado, a little jar of olive tapenade and a small package of smoked salmon. I had some stale pitas that I turned into tasty crackers by heating them with a drizzle of olive oil, a shake of rosemary and some salt. Leftover homemade hummus from my cooking class earlier that week. And some juicy slices of red and yellow peppers, and tomatoes. Saturday morning, the leftovers from these snackies transformed a couple of poached eggs (one of James' specialty) and sunflower seed bread into a tasty brunch. Drape a slice of smoked salmon across the egg, followed by some avocado, and give it a dollop of Dijon mustard mixed into yogurt. Slices of peppers and tomatoes on the side, along with a piping hot scoop of the Lebanese fava bean mix, also leftover from last week's class. 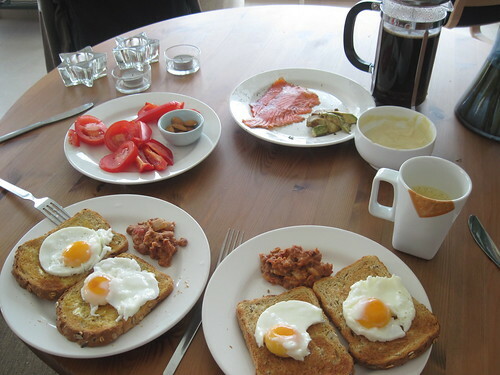 Cups of oj and a pot of coffee for the gentleman, and we were set for a nice meal! 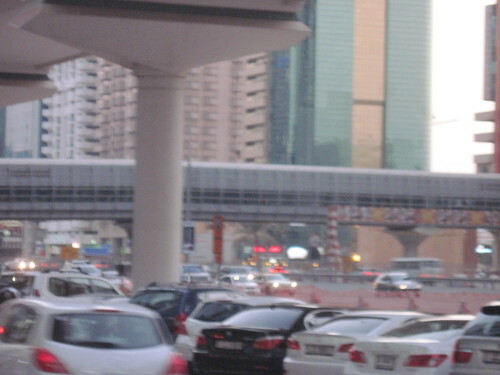 The previous week, we'd read about a new grocery store opening on Sheikh Zayed Road, and we'd cruised by to look for it, already noting the lines of cars parked along the road. Then, riding the Metro to the cooking class, my friend pointed to the building and said it was one of her favourite places in Abu Dhabi. So this past weekend, we checked out Jones The Grocer. 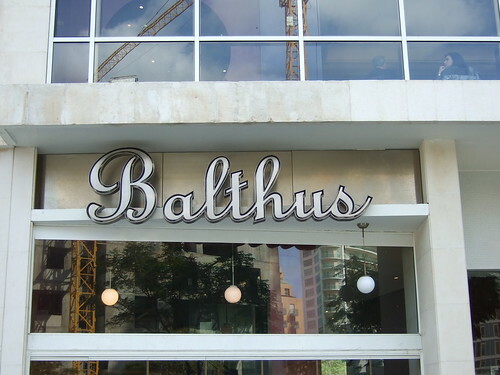 I thought it would be like Balducci's, lots of aisles of fancy treats, but it was more of a cafe with the perimeter lined with fancy treats. 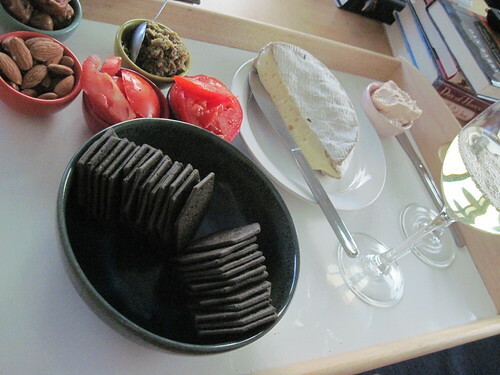 We got nice wedge of cheese, some tasty crackers and smoked salmon dip, and this formed the foundation for our evening tapas meal, along with some sunny tomatoes and some more olive tapenade. All made particularly delicious with a cold glass of wine. And some dates and almonds for dessert. I'm taking an Arabic cooking class, which means that once a week, I take the Metro out past the Mall of the Emirates and Marina to Jumeirah Lakes Towers ("JLT" in local speak) where our teacher demonstrates three different dishes for us. We take notes on recipe print-outs and watch the easy prep, before sitting down after the 90 minutes to enjoy a meal of the demo dishes. Last night's class featured classics like hummus, shish tawook (chicken and onion skewers, where it's allll about the marinade), and foul medames (pronounced fool, we've sampled this dish in Lebanese restaurants before and it was amazing to see how easy it is to prepare - fava beans, tomatoes, lemon juice, garlic, yum). The week before, the menu included baba ghanouj, chicken marinated with zaatar and baked with layers of potato, mushroom, onion and tomato rounds, and umm ali, a delicious dessert that I will likely never eat again after seeing how it is made (tear pieces of butter croissant, heat cream and condensed milk and pour over croissants, then slather with whipped cream and throw it all in the oven - yeow!). I repeated the zaatar chicken recipe over the weekend, zaatar being one of my favourite discoveries in the Middle East (along with blended lemon + mint drinks), filling the house with nice lemony chicken fragrance. The attraction here must be the coin-operated horse and cars for the kids, as the plaza outside this store was full of families with young kids. No one was running around too crazily, thanks to the heat, but there was enough of a breeze to keep things mild in the dark. We wandered this road after enjoying cheap Indonesian food at a place tucked into the maze of back roads in Karama, tasty skewers of sticky satay and a bowl of soup cooked with coconut milk. "Is this your first time here? 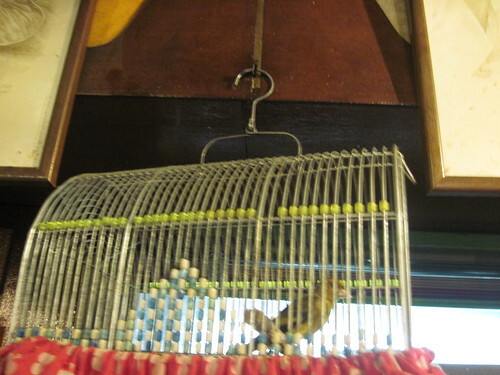 ", our waitress asked us, as we settled in at one of the 8 or so small tables. Yes it was, but we will be back! 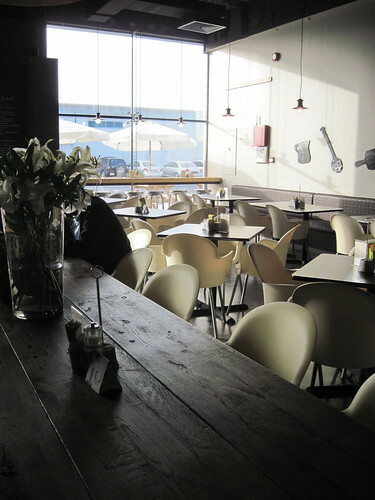 As I've been writing to friends with recaps of the South Africa travels, I've been describing Cape Town as having all sorts of eclectic artsy bakeries and cafes - in other words, my kind of place! Give me a counter packed with muffins and platters of salads and a chalk board scrawled with assortments of teas and juices, and I'll choose that over gourmet living any day. 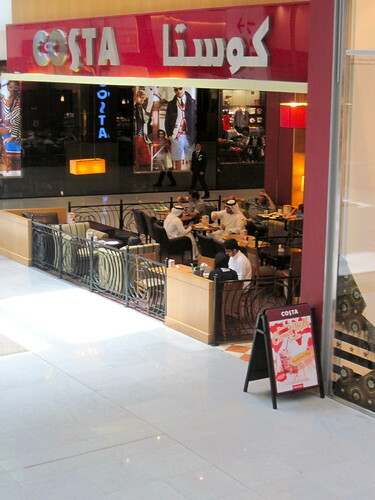 There's a place in Dubai called The Lime Tree, and it certainly fits the criteria. It's known around town as an expat haven, and the 1st time James took me there, the line was full of accents, mostly Aussie and English. Ladies stopping in to get their post-yoga coffee and granola, blonde ponytails and shorts, strollers with kiddies. On a recent morning, I was listening to Dubai's version of the Morning Zoo, and they were taking live calls from listeners for a contest. When they asked the winner what she was up to right then and there, she replied, "just on my way to Lime Tree for coffee." The radio DJ jokingly congratulated her for having just made "the most 'Dubai' statement of all time". (Or something like that). 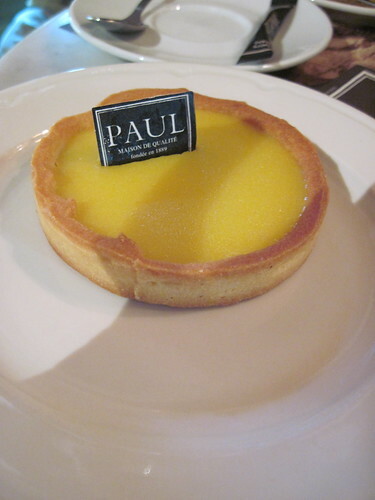 They then went on to tease her about the "coffee" comment, since this cafe is well-known for its cakes as well. 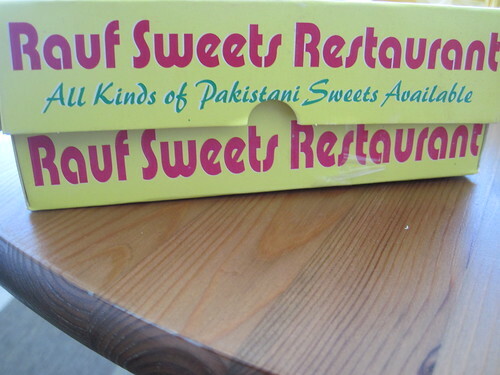 Speaking of cakes, let me tell you about my favourite one on the menu. 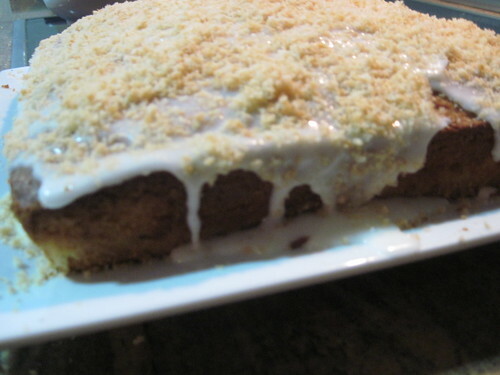 They have huge wedges of moist carrot cake, big chocolate cakes, and a great variety of other beautiful concoctions. 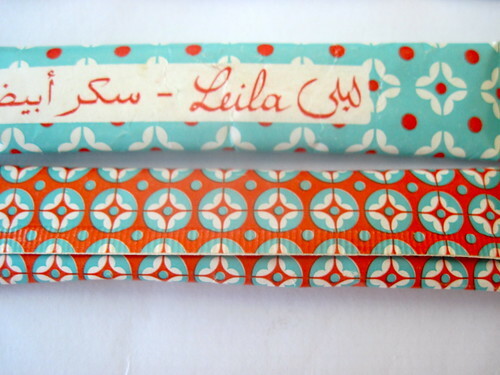 But the first time I was at Lime Tree, something else appealed to me: the lime coconut bar. Oh, this modest morsel, so small compared to the slabs of cake, yet so potent and delicious with its tang of citrus and sweet coconut. An instant favourite! I've ordered it almost every time I've been to Lime Tree since then; no need to audition other options from the menu, I've got my #1 favourite! 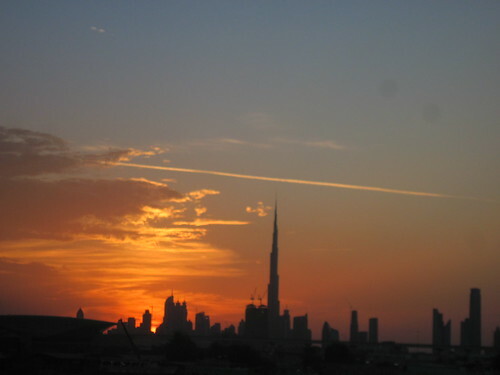 Summer in Dubai is like going to war: you need a strategy, a game plan, an end goal to fixate on at all times to ensure the enemy (cabin fever, Seasonal Affective Disorder, really boring grouchiness) fails to ensnare you. We've already got our strategy for Summer in Dubai. One of the many fun things we've started doing is picking out a recipe from Smitten Kitchen on the weekends, writing up a grocery list and then, in the evening, cooking up some fantastic healthy meals! As we were looking at some options for recipes last weekend, something caught both of our eyes, a link to another recipe buried below the one that we were looking at. And in that one link, was embodied the promise of amazingness! Lime Coconut Cake. James had never even made a cake before, and let's just say that, as his first foray into cake-baking, this was a total triumph! That tang of lime, that toasty coconut sweetness. The moment of victory when he flipped the cake pan over onto a plate and the square fell out perfectly. The cake has lasted us all week, giving us the nicest lime flavour from small morsels that we've enjoyed in the evening with our tea. Our summer strategy is working out just fine so far! Turns out, it doesn't matter if you work Sunday to Thursday instead of Monday to Friday, that end of week vibe is always the same. Late on Thursday afternoons, the girls in the office start cranking their dance tunes and the creatives stroll through our wing of the building to grab pops from the fridge and laughs from their friends. Emails are exchanged, "I'm almost ready to wrap up for the week!" and soon enough, we're in a taxi bound for Deira. 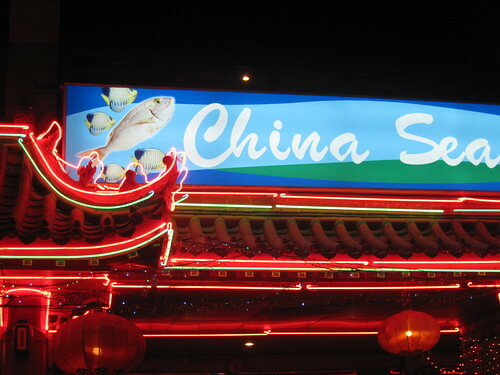 Our city guide named this place one of it's best Cheap Eats in the city, and we loved it! 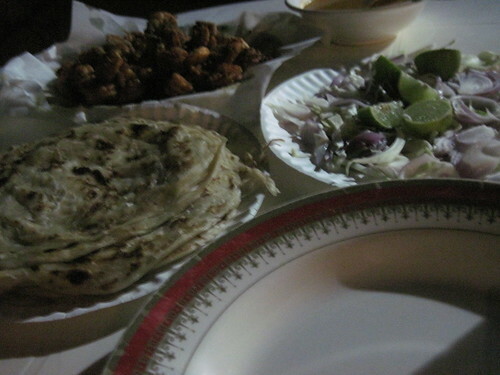 On a warm weekend evening, we drove out to Satwa Road for dinner at Ravi's. 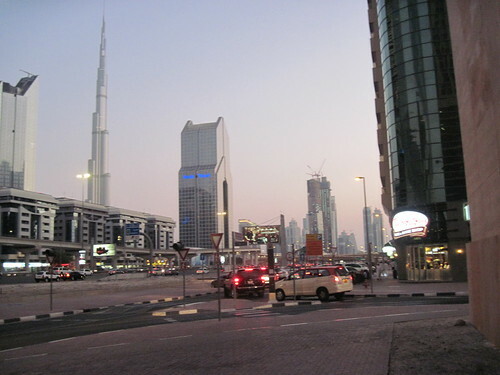 Satwa is one of my favourite parts of Dubai, thriving with energy, crowds of people wandering the sidewalk. 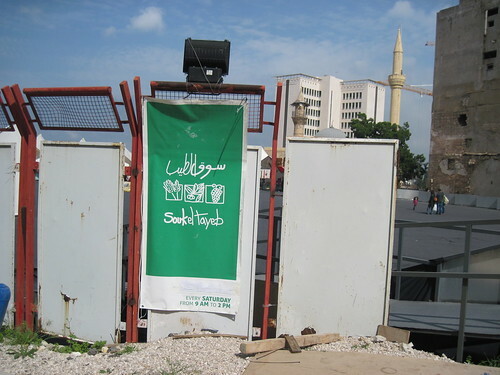 We arrived just as the men were filing out of evening prayers at the mosque, crowding to chat on the sidewalk, crossing through the dense traffic to get to the shops. At Ravi's, we got a table outside, giving a vantage point from which we could watch the street life - the old man having an animated, laugh-filled conversation with the traffic cop; the big SUV that awkwardly pulled right onto the sidewalk as a temporary parking space, only to be honked back onto the road by those blocked behind; the father carrying his son, high on one shoulder. Little pots of rich chicken dishes arrived, scooped over jasmine rice to soak up the spicy sauces, and then eaten with crispy naan. So tasty! 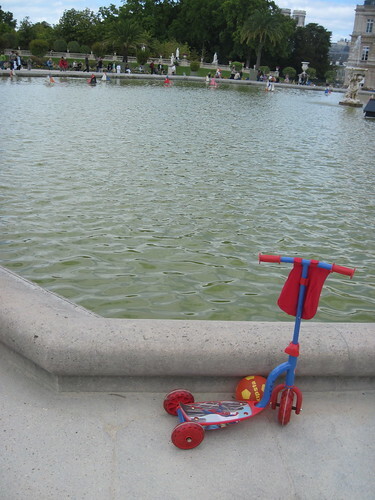 Lots of other neat little moments and photos to share from the Springtime in London weekend. 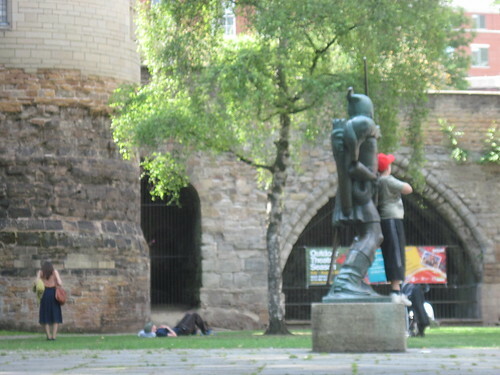 As we were strolling Cambridge, I asked James if I could peek at the map. "Not right now, because there's a place on there that's a surprise." 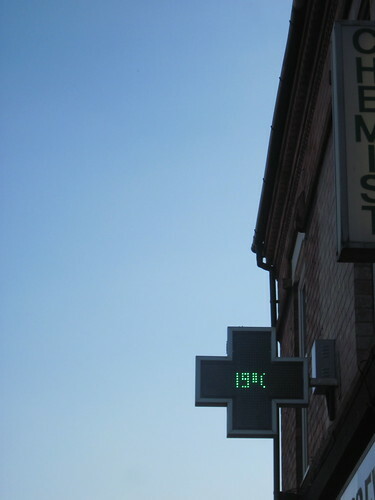 We kept walking, and for a moment, I thought he was taking me to the Department of Chemistry. But then, I saw a place, and I *knew* it was this. The Scott Polar Museum, overflowing with all sorts of stories and artifacts from North and South Pole expeditions - the stories that I love to read, Shackleton, Scott, Amundsen. Absolutely fascinating! Great surprise! 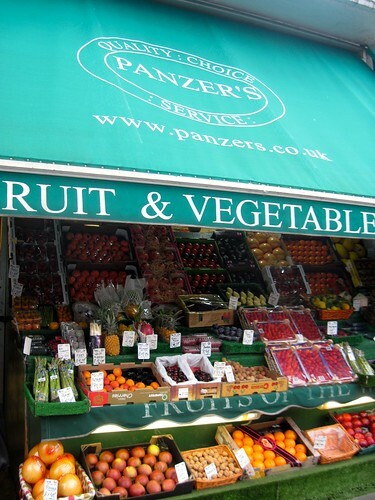 James took me back to this amazing little Portuguese bakery near Portobello Market, where the tables outside are packed with people having animated conversations, and the patrons crowd inside to call out their orders to the clerks. Two custard tarts please! We went to a neat photography exhibit. 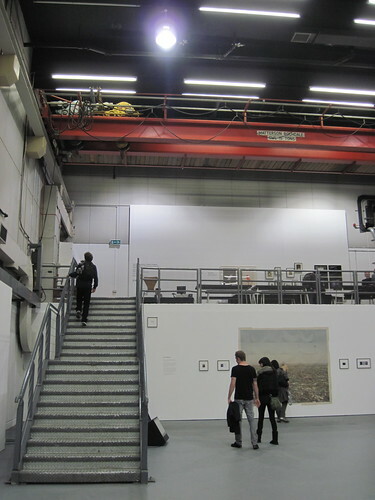 To get to this gallery, you had to turn off the high street, walk down an alley, and around a corner, et voila. Some stenciled street art in Notting Hill. This shop on Portobello Road had sewing machines as interior decor. This stretch of Portobello had art that looked like a photo of someone's record collection. And some cool colourful tiles at the intersection where we turned to get the aforementioned custard tarts. 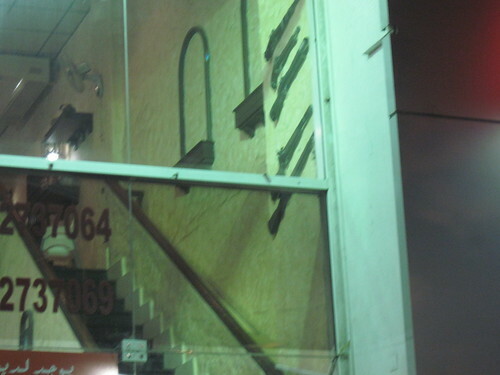 I liked this storefront, Le Maroc. And one more photo of the happy travelers. 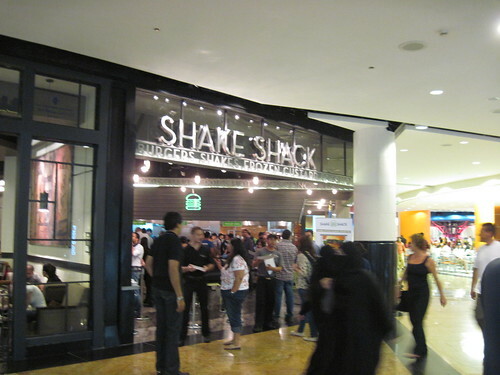 On a visit to Mall of Emirates early in my Dubai residency, I spotted this sign on the boards near the Ski Dubai viewing area and movie theatres - Shake Shack Opening Soon. WHAT!!? The New York institution was expanding to our new neighbourhood? As I wrote in the description of this photo on Flickr, "yesssss". My friend Jeff, who had moved from NYC to Bangalore in 2010, had advised me to eat lots of Shake Shack before my move, since that was something he really missed about the Big Apple. 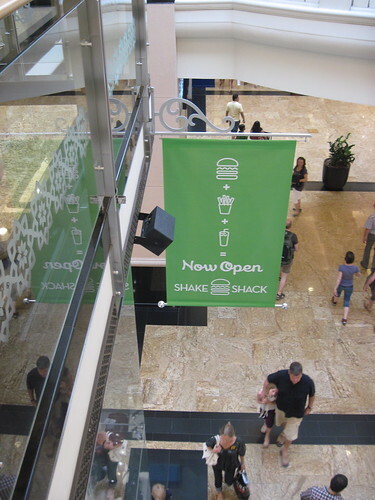 But then, through a combination of factors, either not being able to convince others to stand in an hour-long line, or trying one of the numerous other greatest hits, or just not getting around to it, I ended up not having any Shack Burger moments in 2010. The first time I heard about it was on a trend tour in the Flatiron District. We wandered through design stores and art galleries, and then our tour guide led us to Madison Square Park, crossing the street to a trendy brown-rice-and-tofu lunch place. The senior executive on the tour lamented, "darn, I thought we were going to Shake Shack." There was the first time I stood in line at Madison Square Park, a summer night in Manhattan, the sunsetting around us and illuminating the skyscrapers in that gorgeous rosy gold. As we ate our burgers at the metal tables, fireflies glowed around us. The one and only time in New York City that I ever saw fireflies. The legends of interns at the investment banks surrounding the park, being given the crucial business objective task of monitoring the line from their office windows, and rushing down to procure lunch for the managing directors. The time that Maurice and Julien came to visit New York from Holland, and I thought they'd love a little dose of the Shack. We got to the park, saw the usual enormous line of people snaking from the counter around the corner, several blocks long, several hours long. We got in line, and Maurice and I told Jules to hold our spot while we went to the non-burger line (the express B line, B = beverages) to get some beers to have while we patiently waited. The lady at the counter took our order, and I was suddenly worried that we were going to break some bylaw, so I asked her if it was okay to drink the beers while we waited in the other burger line. She thought a moment and said, "you want burgers? I'll just put your order in right here." I couldn't believe it! 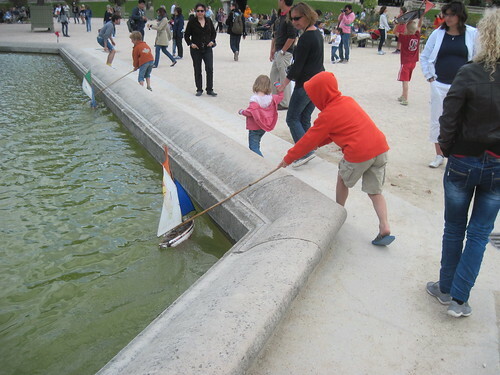 I'm not one to budge at all, and always see fairness in properly lining up. 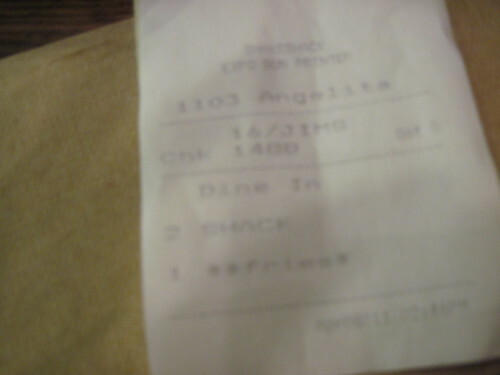 But she was offering, so we put in our order. Just then, the manager walked behind the cashier, saw what was happening, and TOTALLY scolded me. "You know this is just the B line, right? Beverages only!!" 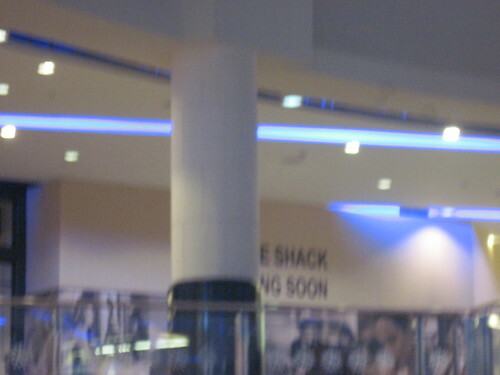 As the empire de Shack started to expand, outlets appeared in Hell's Kitchen, on the upper West Side, and even in the Mets ballpark, where people would go line up and return with burgers about 5 innings later. But SO worth it. 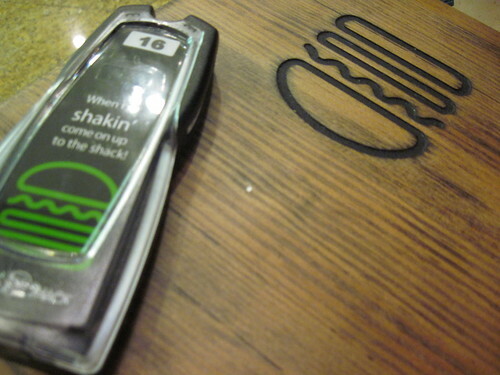 As I wrote in June 2008: If you're coming to New York City to visit me, please remind me to take you to Shake Shack. It's just one of those excellent NYC experiences, coupled with a FANtastic hamburger. 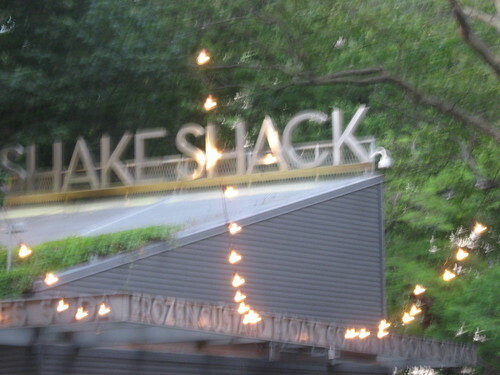 James never had a Shake Shack burger in NYC - it was always on my list of possible places to visit when he would come to town, capturing a quintessential Manhattan atmosphere: people lining up for hours to eat a darn good hamburger at a picnic table surrounded by skyscrapers. But we never made it there. 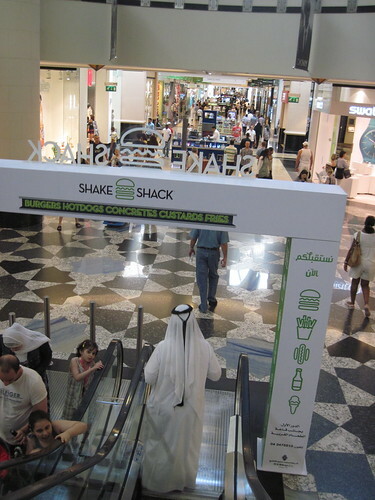 Which means that James' first Shake Shack was in DUBAI! We placed our order, two Shack Burgers for Jims. And we found a table at which to sit and wait for our buzzer to buzz that our order was ready. And then the food arrived, and for some reason, I have no more photographic evidence of our meal. Because we were too busy eating. It was AWESOME. First bite of that burger, oh yes, that's just how I remember. "Jims" enjoyed his first Shake Shack too, and no massive line! A staffer approached to ask how we enjoyed it, and I told him, "I just moved here from New York in November, and have been WAITING for this! SO GOOD!" He was psyched, "I'm from New York too, glad it was just like home." We've been reading the excellent Brownbook magazine ever since someone in the New York office gave me his copies, knowing I was moving to Dubai and might enjoy the "urban guide to the Middle East." It's like Wallpaper or Surface, with a nice focal point on the region's design, architecture, art and fashion. 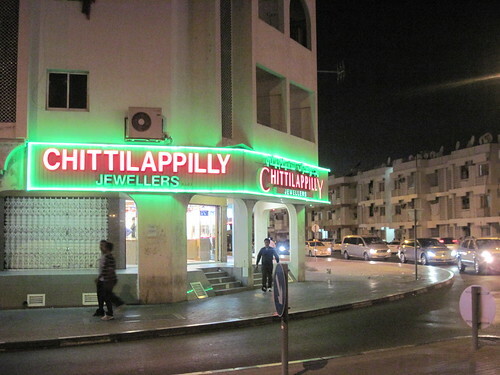 The most recent issue has an article on "Dubai Nights" with photography from some of our favourite parts of town: Little India and the Hindu Quarter, and Satwa. 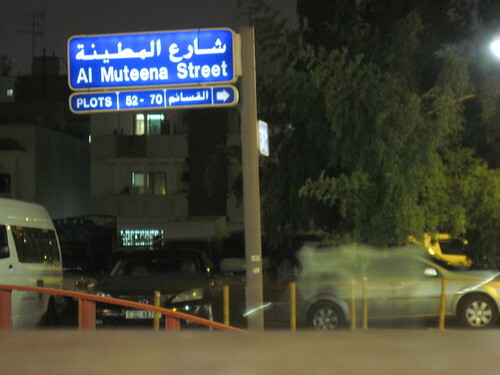 And one area that we had not yet explored: Al Muteena Street. 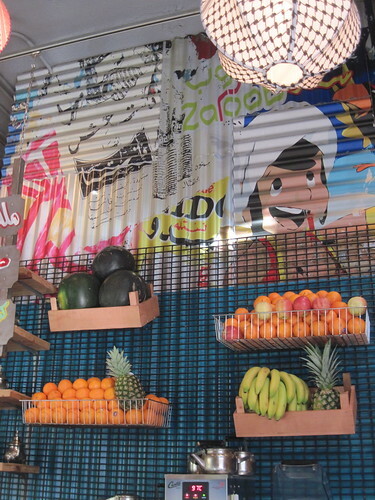 "This unassuming street in the deepest depths of Dubai's old town, Deira, is the go-to for top Iraqi and Iranian eating. 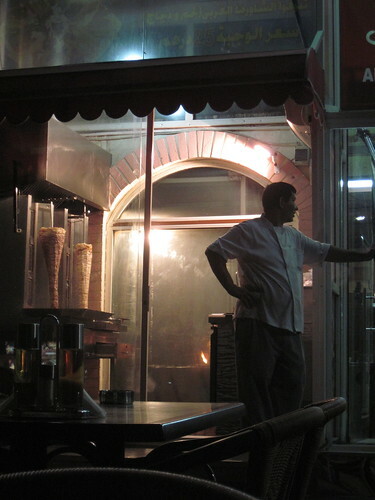 Every night, the masgouf-style Iraqi barbecue - a low fire pit in which freshly caught fish is grilled in wood-burnt embers - keeps Al Muteena Street flickering with life." We read this and said: Let's GO!! A warm evening on Al Muteena Street, with jumbo jets taking off from DXB, roaring overhead. 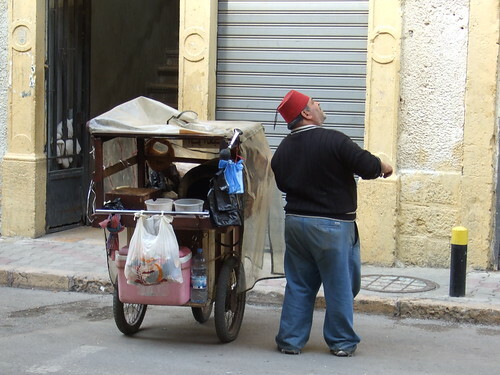 Men with their long beards and shalwar kameez, walking in small groups, or biking efficiently along the sidewalk. We found a seat outside at Bait Al Baghdadi. 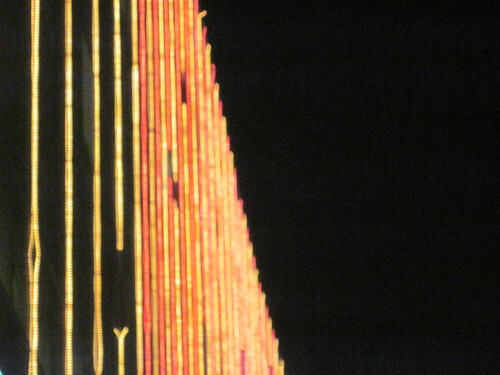 Note the decorations on the interior walls. Lentil soup to enjoy, with a squeeze of lemon, as we perused the menu. What to have, what to have? 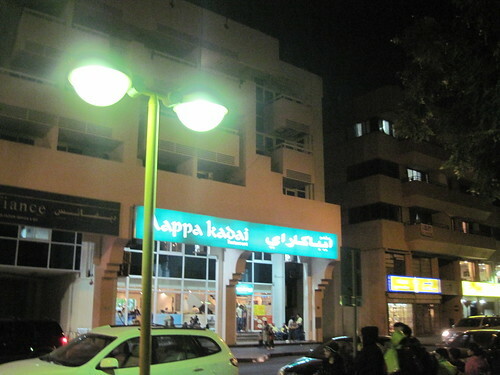 James goes for the delicious shwarma, I go for the Baghdadi kabab. Little dishes of cucumber yogurt and tabouleh accompany. Hot fragrant tea rounds out the meal. More bikes and clusters of bearded men walk by. A teddy bear of a man holds a mewling baby who appears to be only a week old, as the veiled Mom smiles at them. Emirati men sit next to us, and the staffers emerge from the cafe interior to pay their respects. 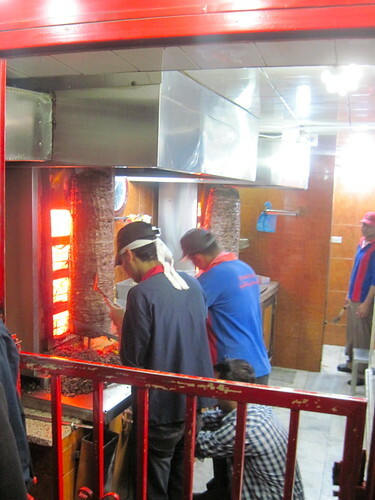 The Iraqi barbecue, written about in the article, glows within. To digest our food, we took a good long walk back along Al Muteena to a street with a name that dances when you say it aloud. Come on! Read that out loud, you know you want to! 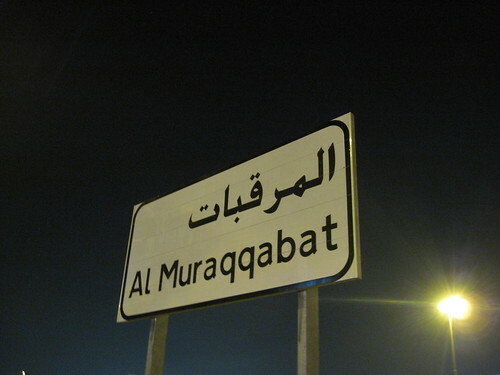 Muraqqabat! 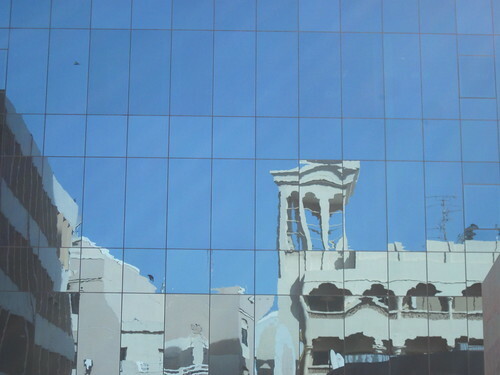 As we strolled along, I said to James that it still felt like there were probably many layers to Dubai that we have not yet explored, just as we had never been to this part of Deira, and found it to be a treasure - what other buried treasures are there left to find in Dubai? We want to support the local farmers who come out to sell their produce at the market in Souk Al Bahar on Friday mornings. Bright red tomatoes, onions, an eggplant so perfectly round and purple that it looks like a child drew it with crayons, a loaf of bread, a red cabbage, and little tiny zucchinis (let's call them courgettes, it sounds so much more elegant). 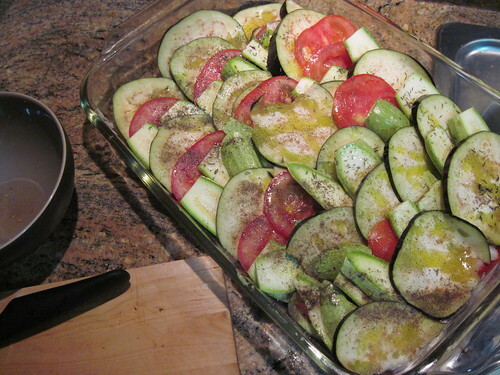 In fact, an entire kilo of zucchinis... prompting me to look up recipes when I got home, and when the first search result was zucchini bread with chocolate chips, I was DONE. Also found on the weekend - Cadbury Mini Eggs! I love those little pastel things, they look so pretty in a small bowl. 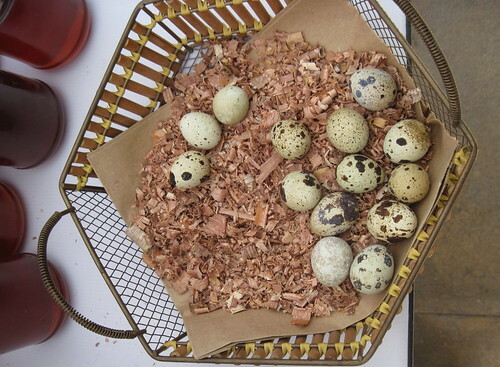 Meanwhile, back at the Farmer's Market, clucking chickens, pheasants, quail and baby geese in a cage, and a small bowl of perfect eggs for sale. Just as pretty, if not moreso, than the Cadbury version. 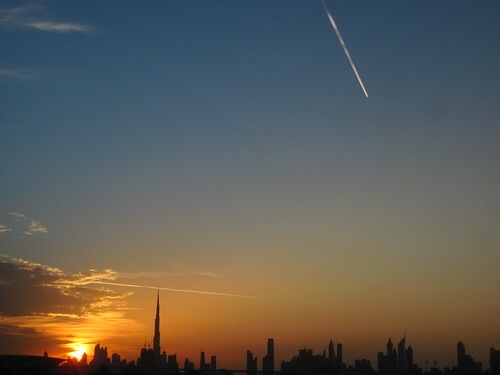 Just before flying to Lebanon, I celebrated my fourth month in Dubalicious, and here are the Dubai Diaries for the shortest month of the year. Many firsts in the month of February - first time crossing the Oman-UAE border in a car (even if there's a very short line, it will take about 45 minutes). First time seeing dolphins in the wild. First time in Musandam. First time at Dubai Jazz Festival. First time meeting James's family. There were several moments that gave me a TOTAL RUSH in February: Finishing the RAK Half. Seeing dolphins leaping in the wake of a dhow in Musandam. Plunging into clear cool waters and snorkeling through schools of blue and yellow fish. A funny story at the Dubai Jazz Festival. Since it was the evening of the half-marathon, I was fairly stiff and not into standing around. So we got to the sitting area with all of its couches, and I just plunked myself down to sit back and relax. Another couple brought their 7 and 10-year-old girls to the event, we'd never met them, but they asked if the kids could sit in the free seats next to us. Of course! I wasn't going anywhere, so the parents went off to mingle while the kids sat next to me and chitchatted away. The 7-year-old became my new best friend, telling me all her jokes and stuff, super hyper. Since the band Train was playing that night, it was pretty cute, the girls had both made hand drawn posters saying "TRANE ROCKS". And then, since Train wasn't coming on until 10, the Mom comes over and gives her kids Red Bull! Hyper times infinity, my new little best friend. James's folks visited, and I really enjoyed their company. Now, when I see the two seats in the window, I always think of them enjoying hours watching the world outside, commenting on the construction workers, the activity on the streets and highways in the distance, the people wandering far below, the fountain shows. You know what I can't get used to here? Escalator behavior - no one walks on them! Or, a HUGE cluster of people will try to get on a downward-direction escalator, and not move the whole way, leaving the Westerner with the entire adjacent stairwell to herself. Or the customer service tailspin in some areas this month. Like, I showed up for an appointment only to be told they had booked me at a place 15 miles away. Me: "but I asked for the Dubai Mall." "Ma'am, you're supposed to be in Jumeirah." Or another time, I arranged ahead of time for a delivery at a certain time that was perfectly convenient with my work schedule, only to be called on the day of the delivery to be told it was mid-day or not at all that day. Well, that's no longer convenient with my work schedule. All that being said, I did have some minor miracles, like finding my favourite moisturizer! And it was on sale! And, huge huge miracle, my resident ID arrived! In other news, February is of course the month of Valentine's Day, and a lot of friends and family had asked me if this was celebrated in Dubai. 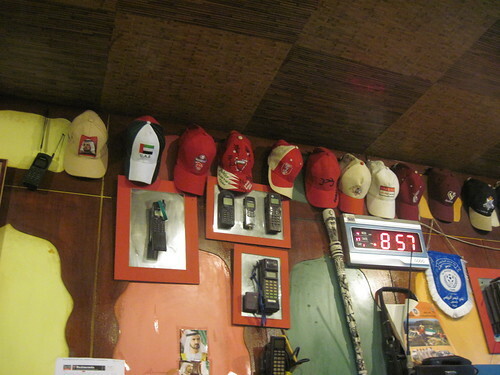 I wrote back that it was like any other place: all the restaurants were decorated in over the top hearts + balloons and red + pink, and the newspaper said that Emirati were the region's biggest gift givers on this day (they LOVE their shopping here and they LOVE their sweets). At the office, there was a constant stream of delivery men as all the Lebanese girls in the office got flowers, cupcakes and stuffed animals at their desk. Leaving for home that evening, there was a noticeable increase in traffic, more people heading home for nice dinners, which is just what we did. Perfect! Time Out's Cheap Eats issue arrived and we tried Noodle Bowl (pictured above). Very much a tasty cheap eat. Across the street was another place we want to try, though we'll probably do that sometime this month, maybe it will be like some of the good lunches in Beirut. 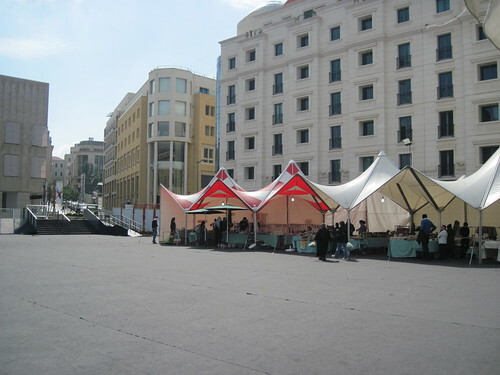 Beirut was a city of cozy cafes and bars, so many that it was often difficult to decide where to go for a bite to eat, and the only risky part (since the food was excellent) was making sure our chosen location hadn't closed down since the guidebook was published. This happened a few times, "well, according to the map, this place should be right on this corner... but now it's a Costa." We arrived early in the morning and after a stroll to get to know the streets, we found our way to a choice that was recommended by every book and website. 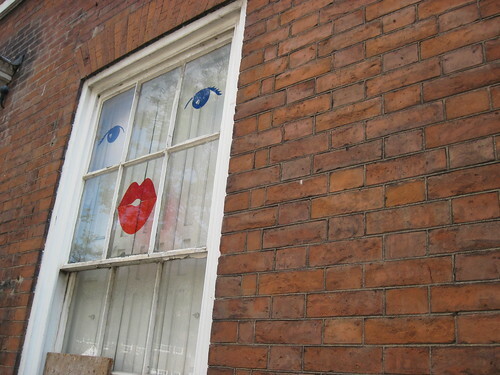 We wandered past and looked in the window, before deciding to continue walking to the end of the district just in case there was something else to see. From within the doorway of this place came the loud call, "WELCOME!" and then again as we peeked at the menu, "WELCOME WELCOME!" We smiled and continued walking, but rounded back when done. "WELCOME!" A table in the back corner, an order of keffeh with rice for the gentleman, and artichokes with vegetables for the lady, along with little teensy glasses of wine (hey, we're kicking off our holiday!). The orders were placed to Mr Welcome, with him calling them out to the kitchen after each item, and the plates arrived within 5 minutes. 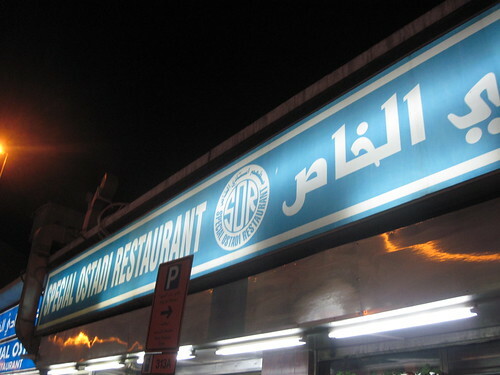 As one of the three recommendations read, "A beloved Beiruti institution... waiters dish up vast platefuls of 'workers' food' to all." 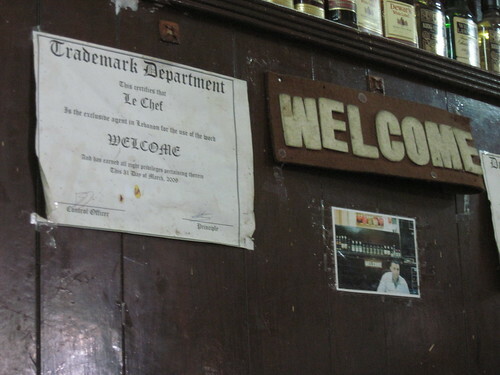 Looking up at the wall behind our table, there was a photo of Mr Welcome and a print out sign reading, "Trademark Department" certifying that they have the Beirut exclusive use of the word "Welcome". 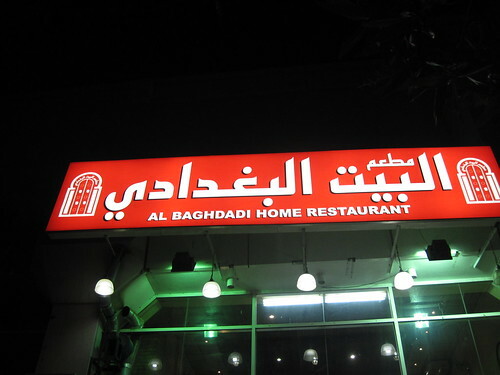 Other memorable meals - THIS PLACE! 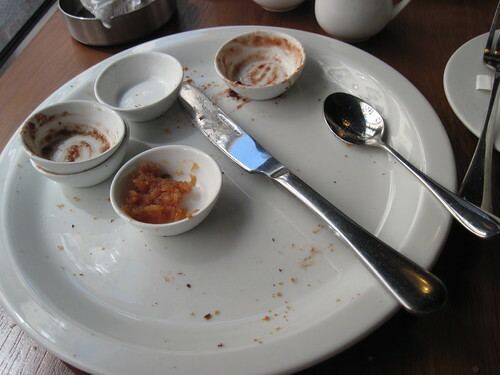 Breakfast in Hamra with pancakes that reminded me of Oma's, and a plate of toast with little jams. Speaking of breads, you KNOW I love my bakeries, and in every new city, I like to find a place that serves morning coffee and croissant. 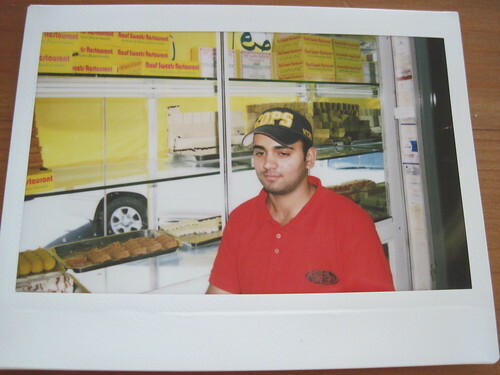 Amy's in NYC, Muscat Bakery in that town, Simond's in Cairo, and the many good places in Dubai. Add to this list, Paul of Beirut. 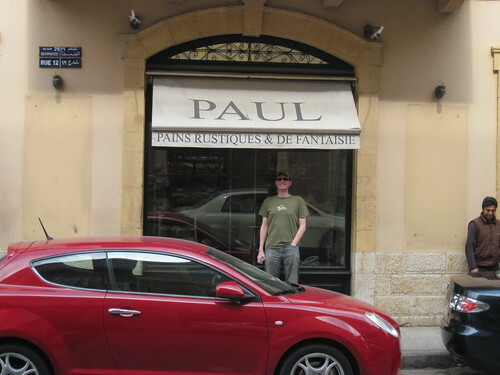 Even from the sign outside the window, I knew I wanted to try the "pains rustiques et fantaisies" and seeing all the well-dressed people jamming into the place for coffees and sandwiches, this was high on my list. Let there be bread! And jam! "I'm just going to order one more treat to go with my tea..."
The plan for this morning had been to stroll to the Beirut farmer's market, check it out, and then hit the pains rustiques place. 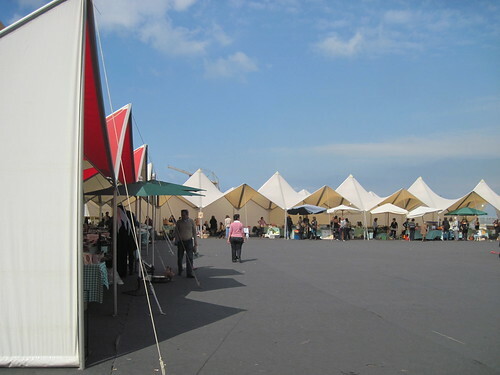 But the farmer's market wasn't where it was supposed to be, and a few people shrugged when we asked. Ah well, maybe it's March and the farms aren't in action yet. Onward to breads! But then on the post-bakery walk through town, James wanted to check out a street we hadn't yet strolled, and out of nowhere, there's the farmer's market! And this was so neat, really gorgeous offerings like jars full of pickled veggies, bunches of flowers, all sorts of baking and local prepared foods. 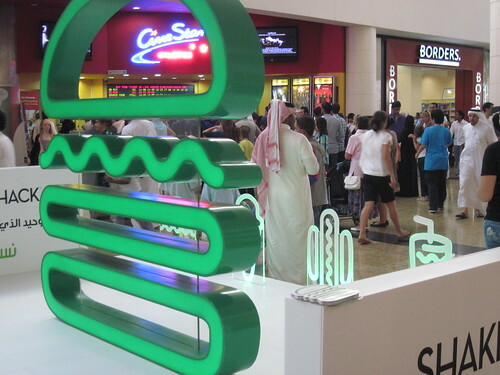 A stand where you could buy a fresh wrapped sandwich. Juices. Kids zooming around on scooters and picnic tables full of people relaxing with their lunch. You have to love a city with a vibrant market like this! On our second European holiday together, James and I visited Rome; being November, with its golden light, it was a beautiful holiday in every way. Two details that come to mind as I compose this post, the first being that we quickly discovered that our favourite dinner places were the mom-and-pop restaurants tucked into lanes across the river from our Aventino hotel, in Trastavere; cozy atmosphere, tasty food and no fussy high prices. The second detail being that, the one store that I loved popping into, in which I spent the most time, was a stationery store overflowing with slick cards, pens, gift sets and design trinkets. 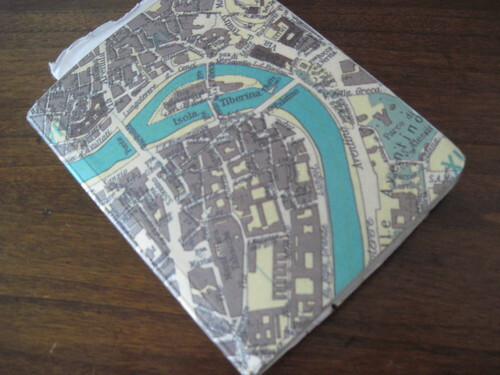 At Christmas that year, one of the presents James gave me was a little gem of a notebook that he had quietly bought while I was in some back corner of that store, and the cover of this notebook features a map of Aventino and Trastavere, our favourite places. 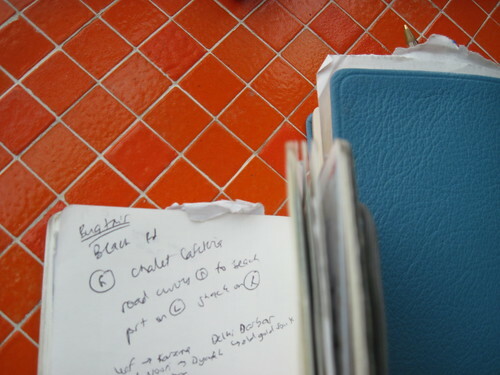 This little notebook became my Dubai Thought Collection throughout 2010. The first page has a list of "addresses to change" and I then have pages marked things like "Stuff to cancel", page after page of checklists and notes for my eventual move. At one point that summer, a friend at work said he had seen the Anthony Bourdain episode filmed in Dubai and that it looked amazing. I waited for this episode to appear again, and took notes on all of the recommendations. We hit Ravi on Al Dhiyafa during my September visit, and went looking for the other intriguing reco, which on the show had looked like an outdoor shack on the beach, but had no luck finding the place. 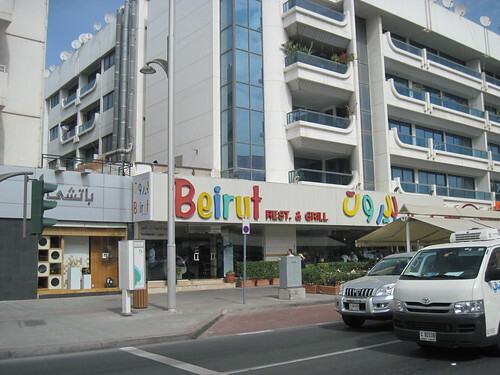 An early lesson in the lack of addresses in Dubai, you can see my notes here, "R Chalet Cafeteria, road curves N to beach, port on L, shack on R." On a later reconnaissance mission through Umm Suqeim, before my arrival, James would report back, "Bu Qtair located!" It had still been on the Checklist since my arrival in Dubai, and finally on Thursday, we had the opportunity to try it out. 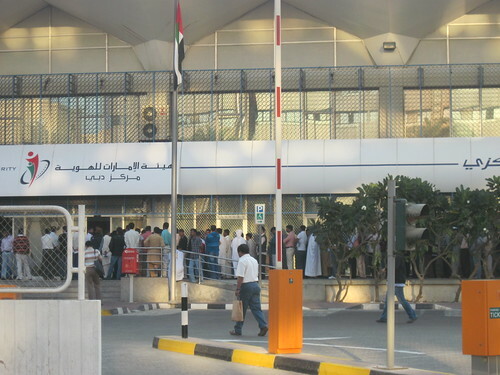 Three items on our TGI-Thursday after-work checklist: 1. one bureaucratic errand at a government office in Al Barsha (I love saying the names around here! 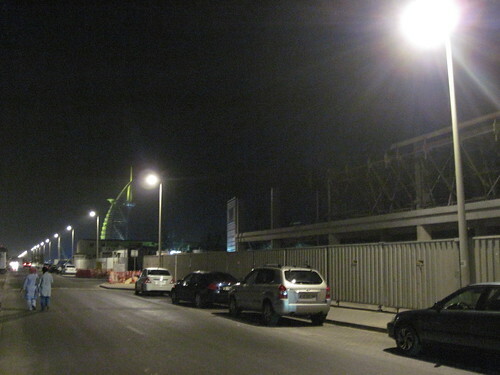 ), 2. since Al Barsha is near Bu Qtair, let's see if they're open, and 3. gallery opening near the apartment. After checking off item #1, we cruised to the beach, unsure as to whether this place would even be open. But then a sign of promise, loads of cars parked ahead! 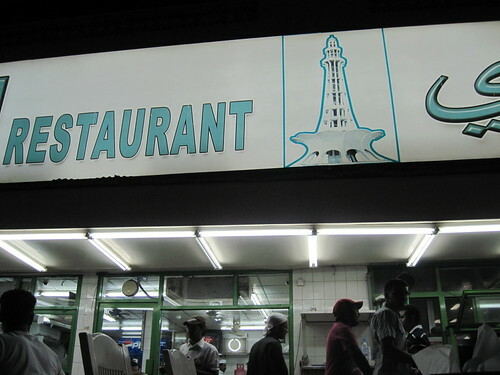 It was dining under the stars, find a free plastic picnic table and look out at the view of the minarets inland and the Burj Al Arab down the beach. Send one of the group into the shack to order. 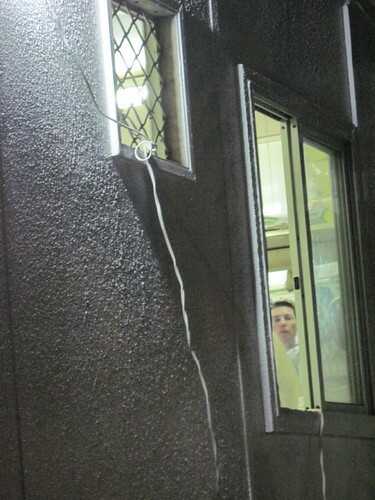 I could see James through the window, once he got to the front of the line. Couldn't hear him, but just saw him signaling to the cook with a wave, and another wave, and another. When he got back outside, as we were waiting for our order, he said there were two choices - choose from the buckets of fresh caught fish, or the bucket of fresh shrimps. He went for the shrimp and the wave had been a, "more please! no still, more!" The orders appear at the window and the mustachioed man barks out the name, "JEHMZ!" 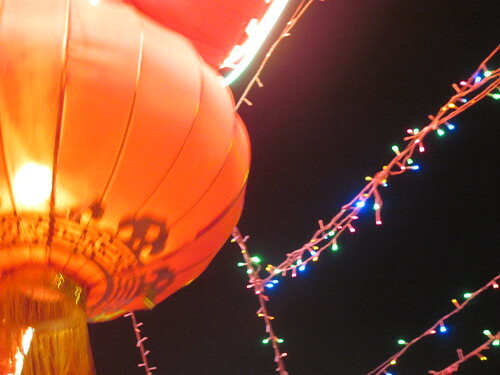 We wave him over, and get a plate of crispy spicy shrimp, a bowl of curry sauce and plate of Indian bread. 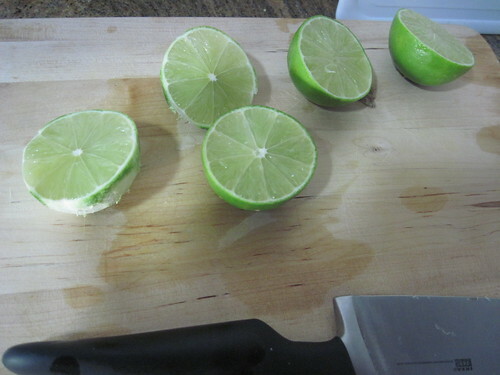 Squeeze some limes on the shrimp, wrap a couple in the bread, dunk the whole lot in the sauce, and ohhhh yes. Anthony Bourdain had described this place as a "Fish Curry Shack in a trailer with some outside seating near the beach where Dhow boats arrive with the catch of the day". 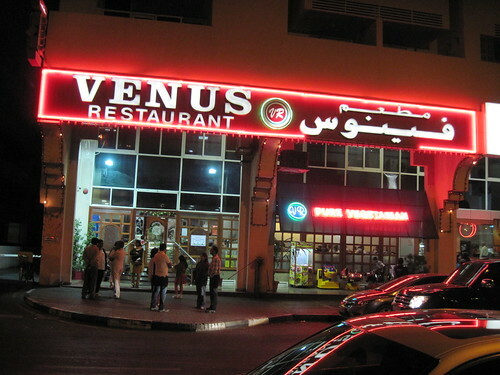 Once again, we confirmed that our favourite meals in Dubai happen in places where the atmosphere is local, the prices are cheap, and the flavours of the food are amazing. I'll take Bu Qtair's fresh-caught seafood eaten at a plastic table over fancy froufrou any day! 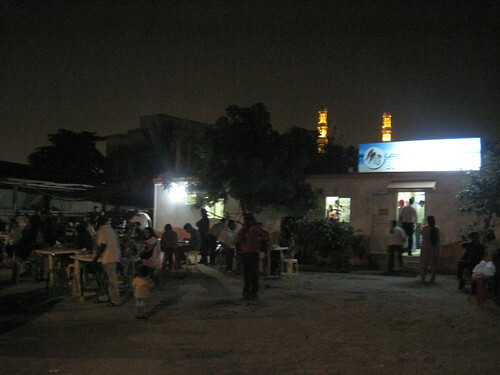 Bellies full, we wandered back along the street as the Burj Al Arab glowed in the distance. Item #2 on checklist, done (item #3 would be crossed off the checklist later that night, details to follow), and it also had that rewarding feeling from doing a longstanding checklist item, one that had been on my wishlist in that little Rome notebook from before I'd even moved here. When it eventually comes time to depart the Arabian Peninsula for new adventures, there are some foods that I will be incorporating into my menus. Dates, for example - so sweet, so satisfying. I eat several at night for dessert, they go well with hot tea. And this juice concoction, pictured above, absolute genius. 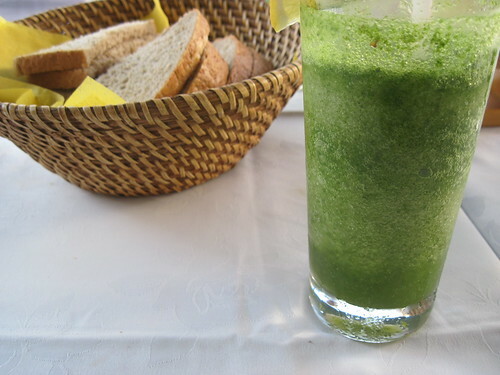 There are lots of fresh juices on menus here, and a staple for the area is lemon mint or lime mint juice. This one was blended with ice for extra refreshment. Some cafes have a version that's less minty, a few bits floating in lemonade. Others look like this version pictured, dense green, mint that's been blended to a pulp. 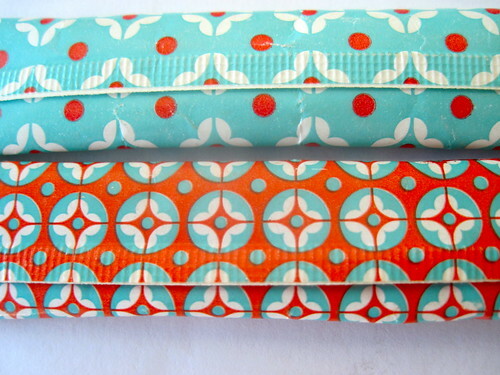 Tangy, minty, fresh. 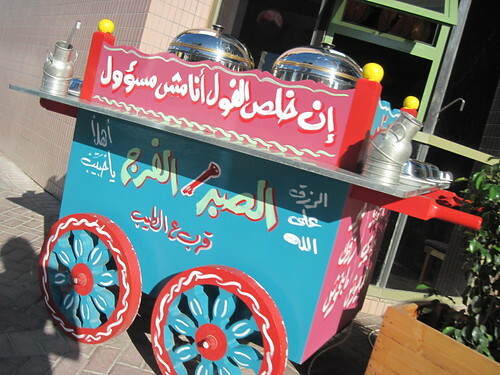 This place has amazing shwarma, and I love their colourful cart for assembling plates of appies. It reminds me of the guacamole carts in some NYC restaurants, where they assemble a bowl of fresh guac, mashed and mixed right at your tableside. I've written in the past about moments when I've LOVED the bread that has been served around here - often it's soft and stretchy, like pizza dough. Some places have toasted sesame seeds baked in. 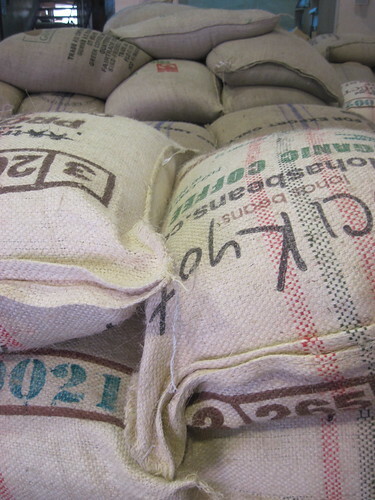 Other cafes serve it warm, one piece at a time. After visiting a variety of bakeries, including a Lebanese place that had tangy thyme baked into their bread, I told James that, where some bloggers have a Life's Mission to sample 1,000 fruits, I could happily embark on a Life's Mission to sample 1,000 breads. I figure I'm well on my way too. 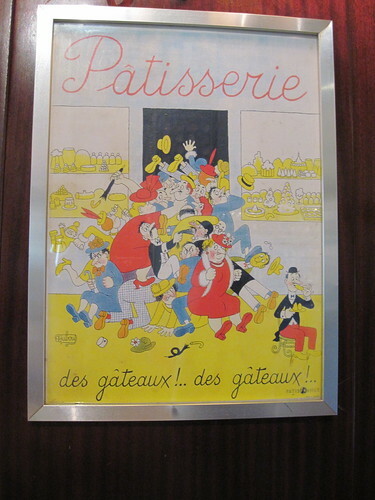 I asked a French colleague at work if he had tried Dubai's French Bakery, aptly named "French Bakery," figuring that the Frenchman would have an honest assessment of the place. He said it's great, but then said that if I really wanted good bread, I had to try this German bakery on Al Wasl. 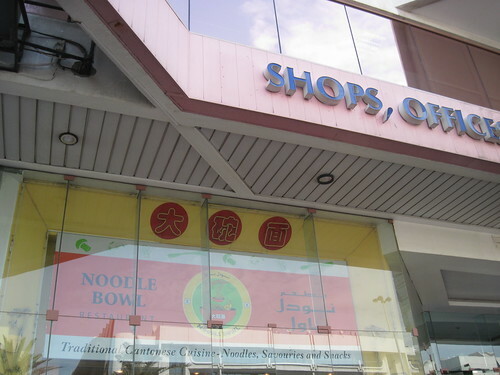 He couldn't remember what it was called, but remembered that it was located in a corner shopping complex. 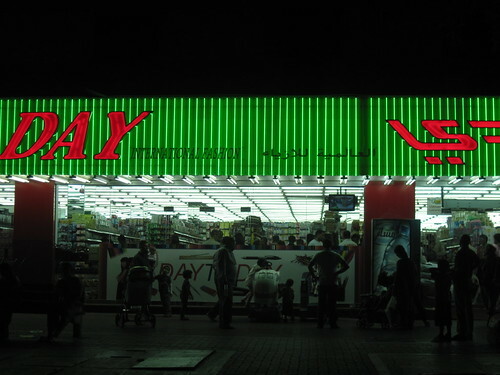 We cruised Al Wasl and then saw the Park & Save corner complex, pulled in and walked around to check out the shops. No bakery, hmmm. 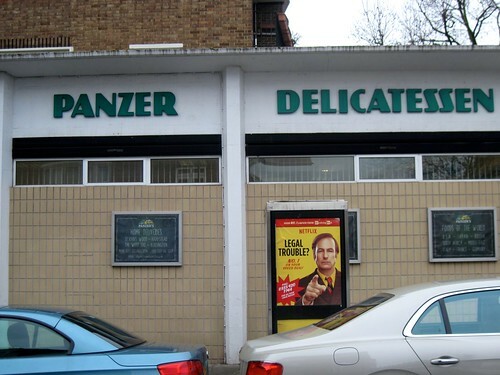 But then we went inside the grocery store, and followed the fragrance of fresh bread to the back, where we saw all these signs written in German. 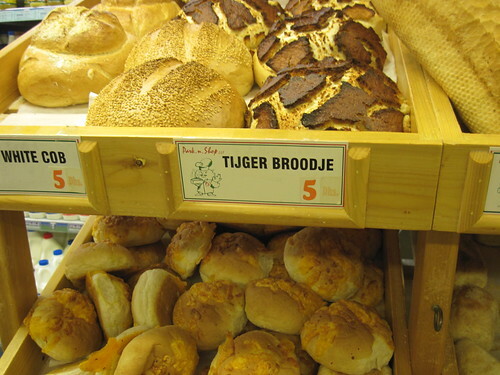 See that tijger broodje? That is a loaf of heaven right there, my friends. Those cheese baps underneath, so fresh and soft, with crackling cheddar baked on top. They also have pretzels that compete with NYC's Standard Biergarten's gloriousness - if we have an Oktoberfest party, I know where I'm coming for pretzels. We have since been back a few times to get more tiger bread, it went exquisitely well with that white bean stew I made a few weeks ago, toasted up and tasty. One more bread to add to my list of 1,000, well on my way to achieving that goal! 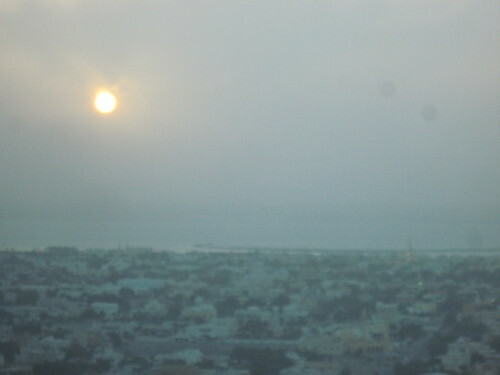 Interesting adventure in the first week of 2011, wherein I had to go on a small bureaucratic odyssey at an office in a neat area of town called Karama for an appointment at 8am. I caught a quick taxi over and when I got out, this is what I saw. Hello HUGE lines of people, all pressing up to the doorway. Oh gawd! I asked various people where I needed to go for my appointment, found myself redirected several times, and then was finally pointed around the corner on the right in this photo. Entered the doorway to find an empty room, where they pointed me to a vacant desk, I completed my tasks for the appointment, and was on my way within 15 minutes. Thought it would be hours when I saw those lines, sort of like the ol' New Jersey DMV... but instead, it was a-okay. Once I figured out the right place to go. Also, speaking of Karama, it's renowned in these parts for having the most AMAZING Indian food restaurants in town, and so we decided to head there for dinner this weekend, hopping out of the taxi on Kuwait Street and walking past all of the vibrantly coloured signage (seriously, so cheerful!) to our destination. 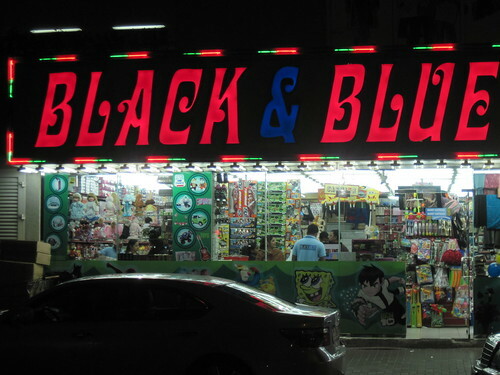 This store seems to sell every fun little toy and party supply you'd ever need. 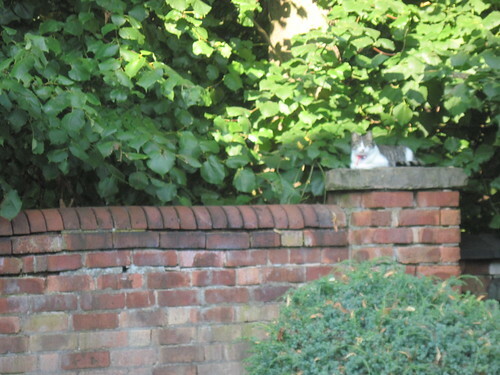 As we were walking through the neighbourhood, I remarked that it was much quieter than I expected. And then I realized, it was because everyone, and I mean *everyone* was eating dinner in the restaurants along the way. 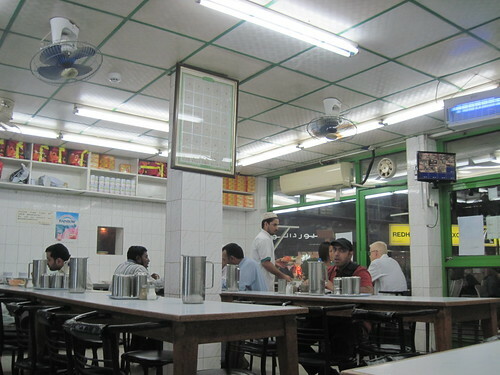 I took a bunch of photos of places that were jammed with locals, with crowds of cheerful Indian families mingling outside - has to be a sure sign of excellent food, right? 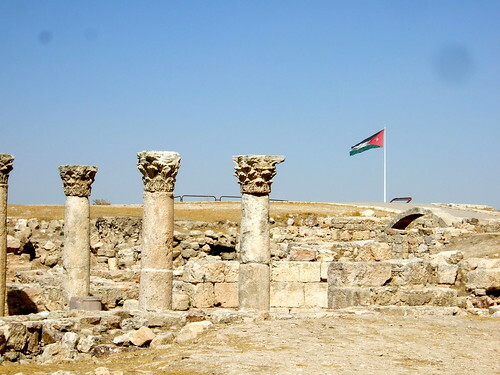 Add these places to our list for return visits to Karama. 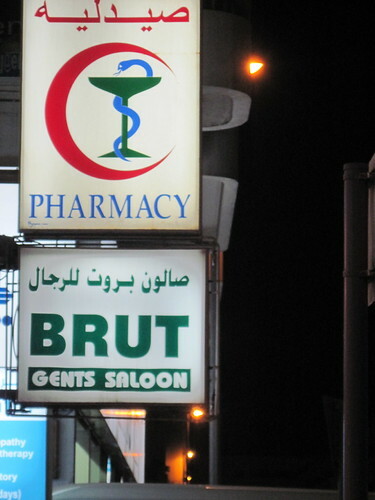 You see a lot of signs like this throughout the region (saw some in Oman and Egypt as well), and it gives me a little laugh, almost makes me picture some old cowboy barber shop through swinging wooden doors, the "Gents Saloon". I took this for Jane and Tom. And I took this because that's just such a neat word to say. Arriving at our restaurant of choice, Manvaar, we enjoyed a glorious meal - James had the butter chicken, I got the channa masala (chickpeas with spice), we split some naan to soak up all the succulent sauces, and rice with peas, cashews, sultanas and bits of bread mixed in (it's called Kaabuli, "Rajasthani Special" said the menu and it was GOOD). There's something about Indian food, where it arrives in these little dishes and you start scooping the steaming, saucy entrees onto rice, and the combo is just totally addictive ("Can't talk, must eat.") - - the sauce + spices + rice + dollop of yogurt all together - - yet those little dishes are almost trick-bowls, somehow seeming bottomless, because it's impossible to finish, even when there's just a bowl of chickpeas and butter chicken as entrees between the two of you. Verdict: amazing, added to our list of favourites. Also amazing - so affordable! After the meal, we went for a long walk in the evening air, and then stopped for a glass of wine each -- price of those two glasses of wine > Manvaar full meal! We wandered back with our satisfied bellies, through the park in the centre of the neighbourhood, where little kids were sprinting around and riding little scooters, and large families were eating picnics, and clusters of teens were standing off to the side, taking photos of themselves doing crazy leaps off of benches, and it was all just such a nice community feeling. 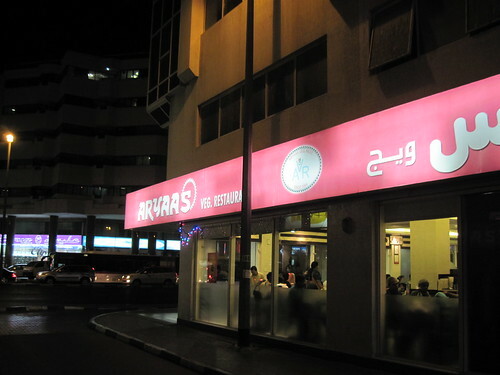 Aye Karama, what a lovely place.